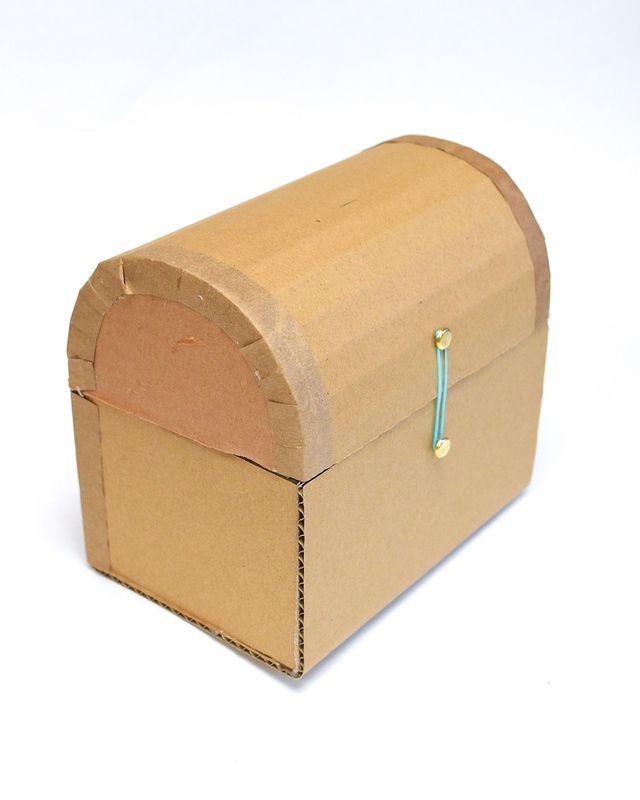 Today we are making a cardboard treasure chest! 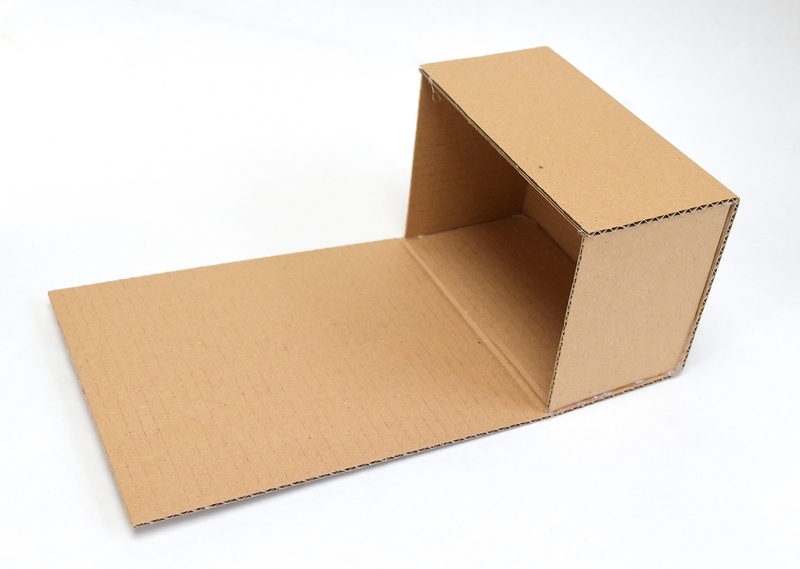 As if the cardboard aspect weren't enough cause for celebration, we're also going to be discussing how to mass-produce these babies. Yes, for parties and summer camps and other boisterous gatherings-of-multiple-children! Summary: I am beside myself with joy! Some context: as mentioned in earlier posts, I am coordinating the crafts for some of the children's programs at our local church. These often involve kids of a wide range of ages working on the same activity. It is a very enjoyable role, but the preparation keeps me on my toes because I'm not content to order random projects out of a craft catalog and watch some kids finish them in five minutes while other kids flail about covered in glue, and surrendering to a hapless adult helper who then completes the craft for them. When working with such a wide age range, the aim then is always to challenge the older children while not overwhelming the younger ones. So I break out the cardboard. Or, more accurately, I head to IKEA and scavenge the recycling bins. Thank the stars for IKEA - between that and Costco, I have an almost inexhaustible free supply of my favorite crafting medium. 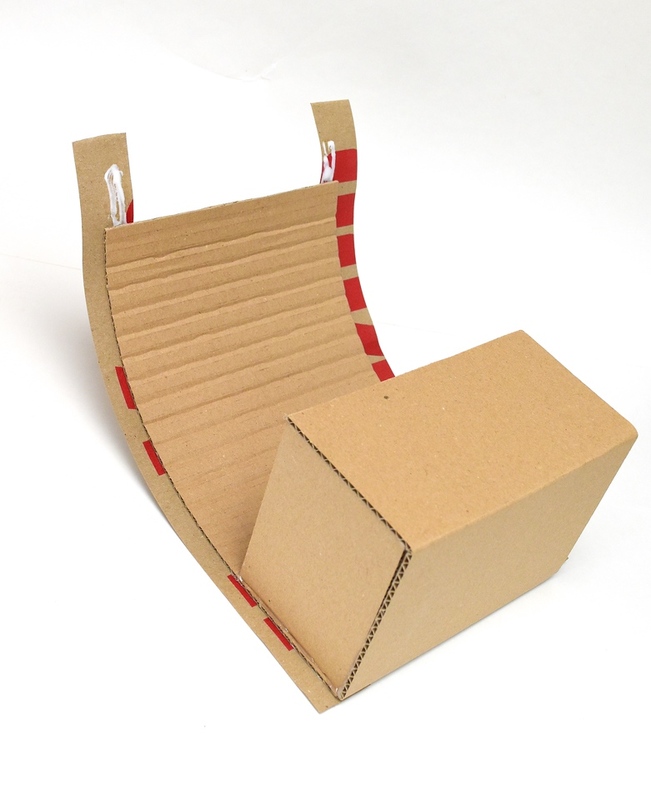 And while I can easily waste paragraphs counting all the ways cardboard is supreme, I shall be practical and extol just this one: it is an open-ended building material and people of different ages and motor competence can engage with it at different levels of complexity. For instance, were I presenting this craft to teenage participants, I'd have them build it the way I do in this tutorial, using hot glue and all the various techniques of connecting and reinforcing seams. 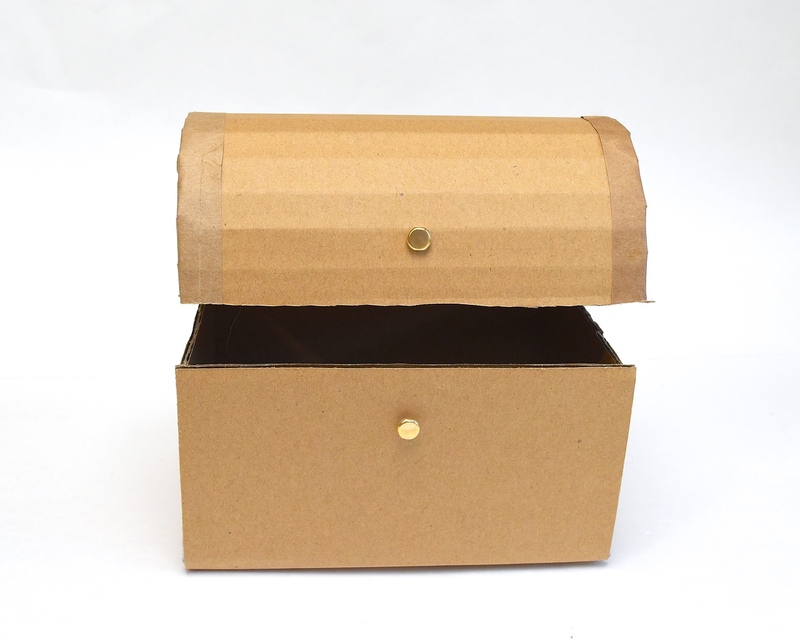 With adults, we could make much larger chests, drafting the templates correspondingly to scale and working on different ways to secure the lid, create hinges, increase the strength of the walls and introduce texture to the finished surface. Some older teenagers could even do this. With children (and limited time), however, an actual build might not be feasible. Instead, they'll get an almost-finished treasure chest to decorate and embellish. As my target group ranges from preschoolers (3 year olds) to 5th-graders (11 year olds), it's a pretty broad playing field. 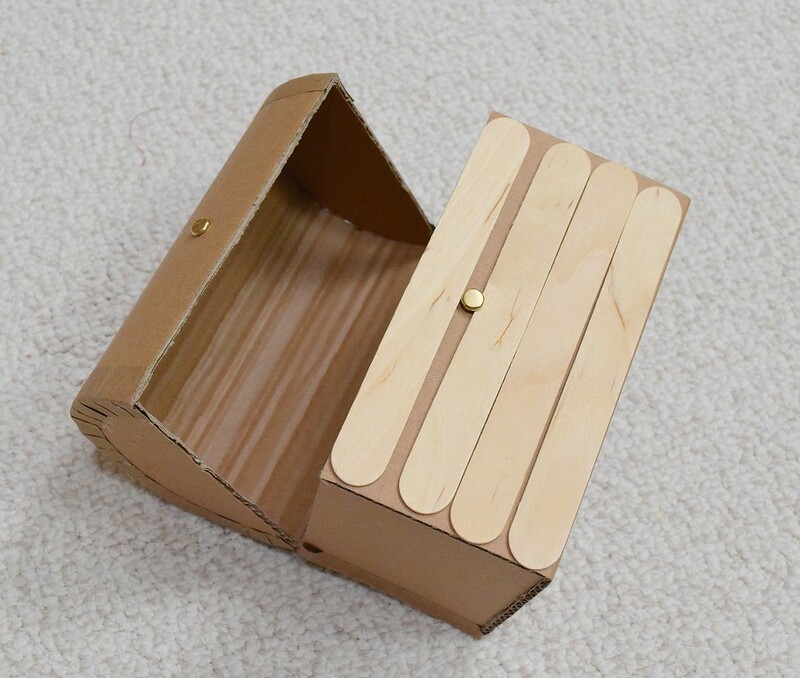 The preschoolers might gravitate to stickers and markers while the older kids might enjoy gluing on craft sticks to simulate the slats of real wood chests. And everyone can slather on paint at some point, and pile on details for ruggedness or bling, or any combination thereof along that spectrum. At the end of this post, we'll talk about how this activity will be customized to the different age groups. 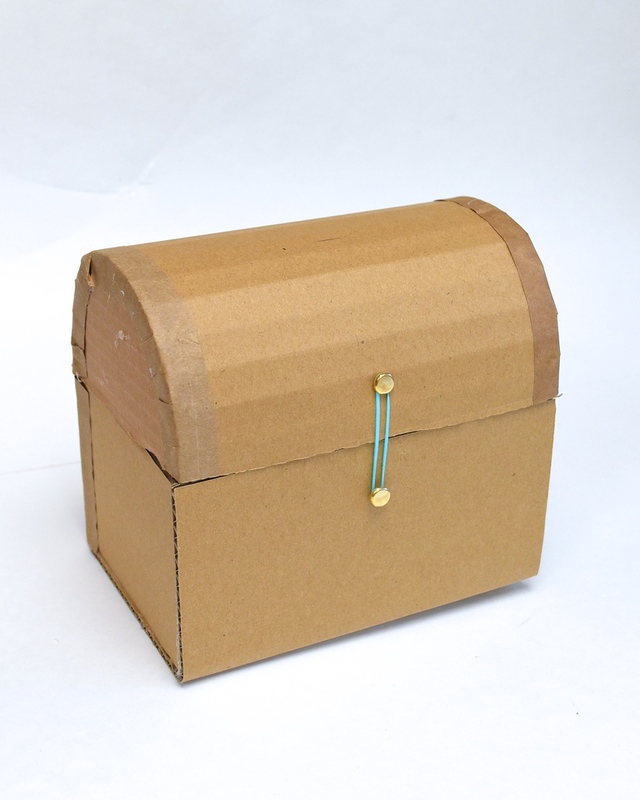 The treasure chest in today's post, however, will be somewhat simplified, as I was making 50 of them for our summer program. 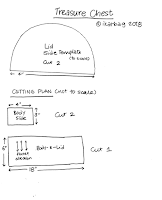 And as we learned in this earlier post on mass-production, when one is hand-making such vast quantities, one must find ways to acceptably cut corners, as it were, while ensuring the outcome is still good. 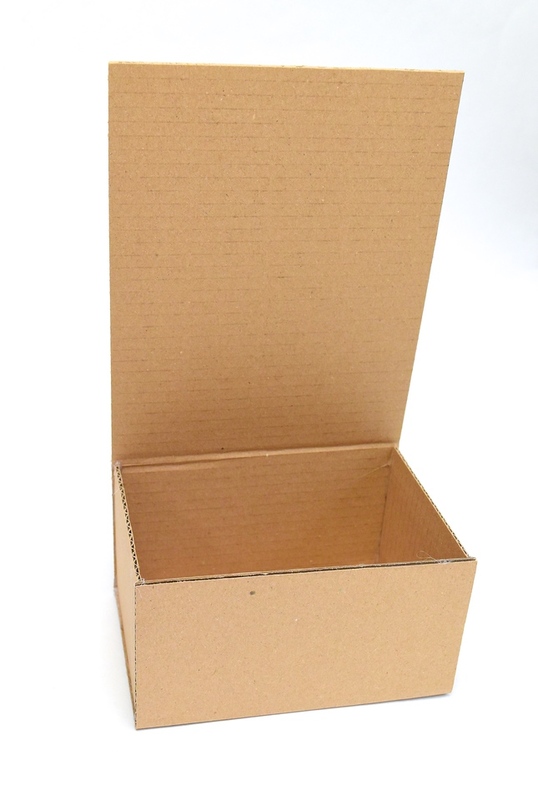 I also want to disclose that I don't necessarily make everything we need just because it's cardboard. Case in point: at Emily's Fairytale Party, we actually bought some cardboard treasure chests. We were already handmaking everything else (including some pretty insane dress-up dolls and wooden swords, and I wanted one fewer thing to cut out and glue. Skipping on treasure chests seemed like a no-brainer. Sometimes you do what's sensible, right? 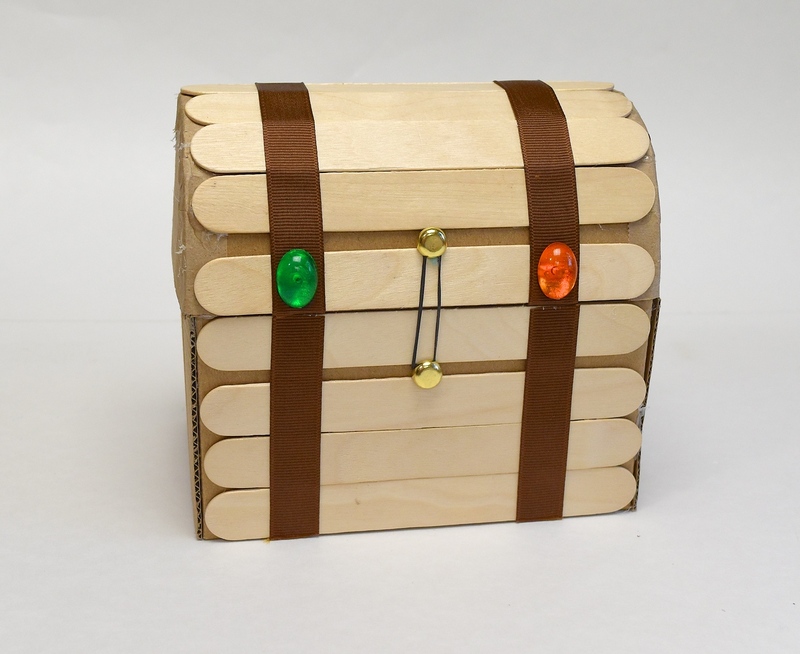 But for this summer program, 50 treasure chests would've cost almost $100 to buy, so we made them for free. Enough preamble; let's make these chests already! 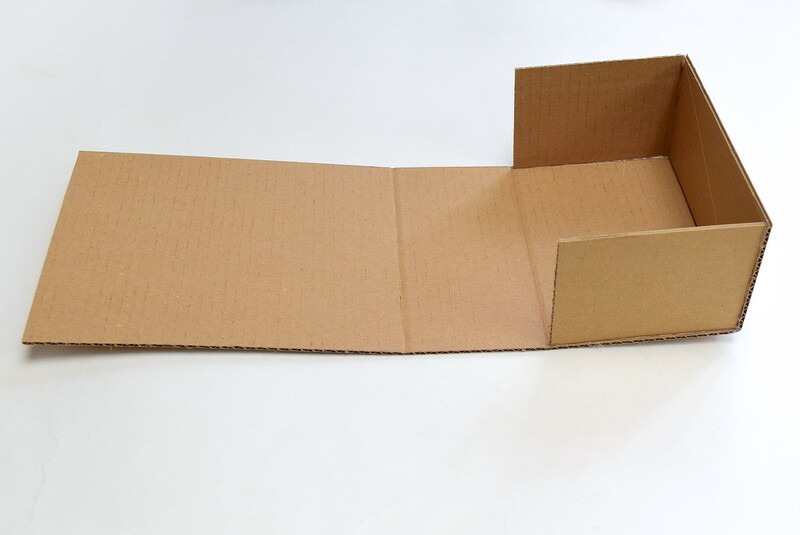 I don't usually create templates for my cardboard projects (I measure and cut shapes directly out of the sheet or box or whatever form the cardboard is in) but I did this time, because I was making so many of the same project. 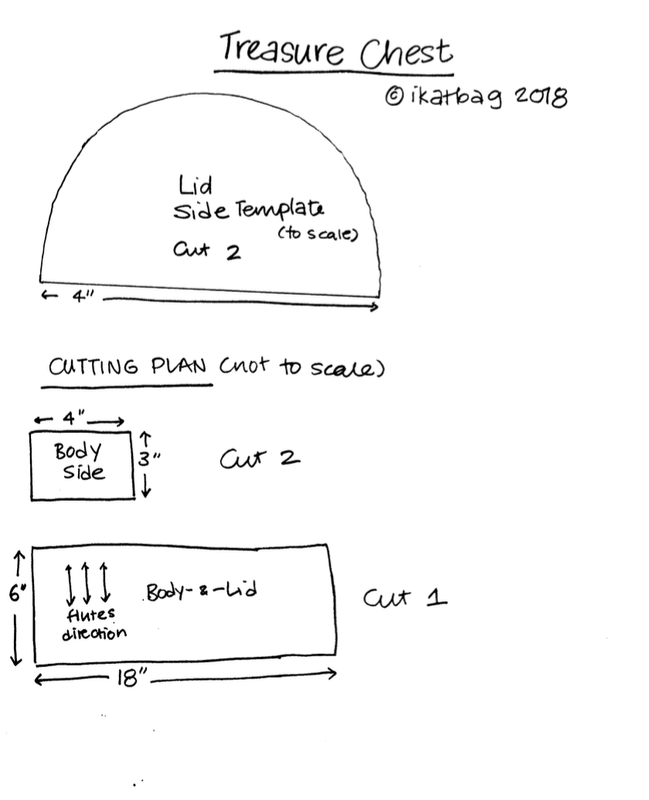 Here is a sheet you can download which contains cutting directions. 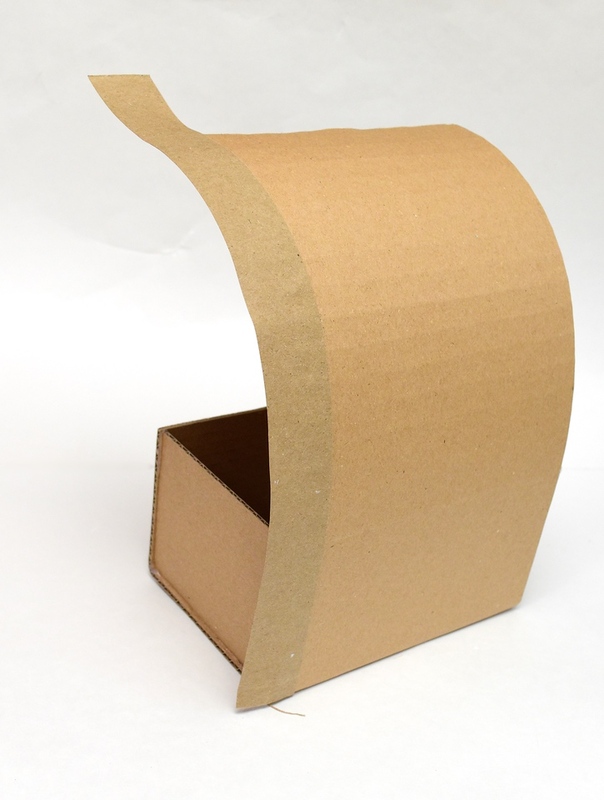 It really just contains one template - for the side of the curved lid. The other pieces are listed with dimensions, and are easy to draw out on your own. Pay attention to the direction of the flutes when cutting out the large piece that forms the main body and lid of the chest. It's a bit like the grain direction of fabric! 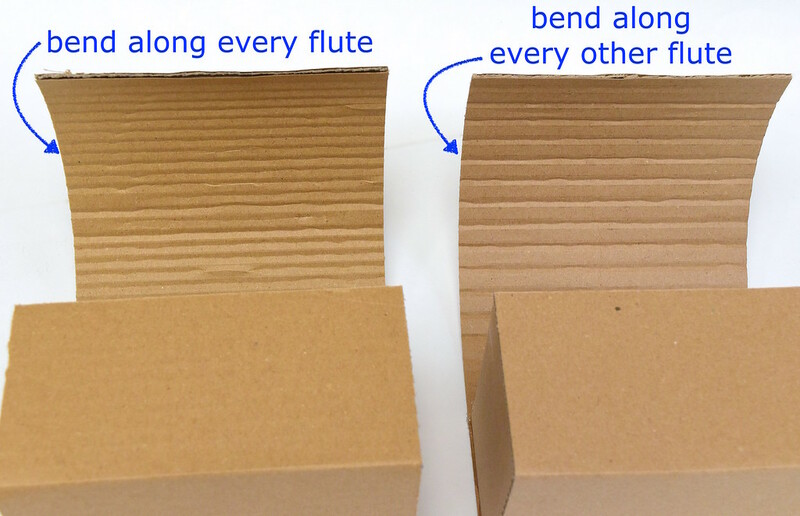 If you're unfamiliar with the flutes of corrugated cardboard, they're the wavy things that lie in parallel rows between the flat layers (called liners). 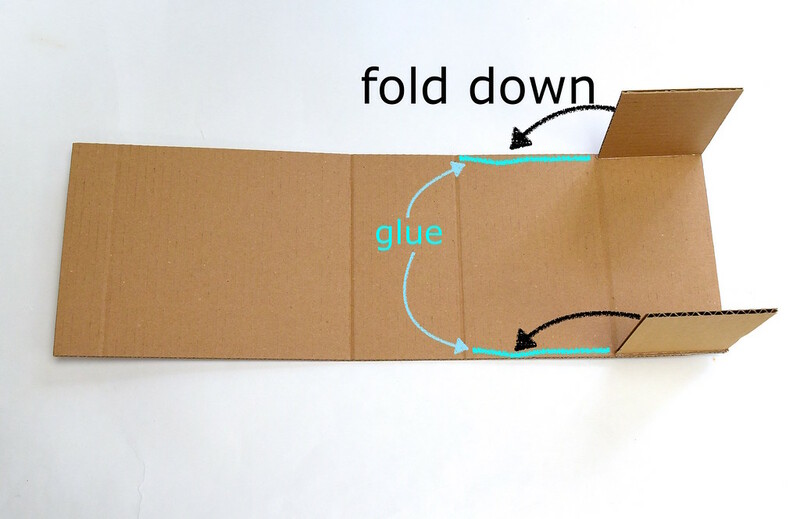 You can read more about them (and working with cardboard in general) in this post. Obviously, you can make these chests in any dimensions. 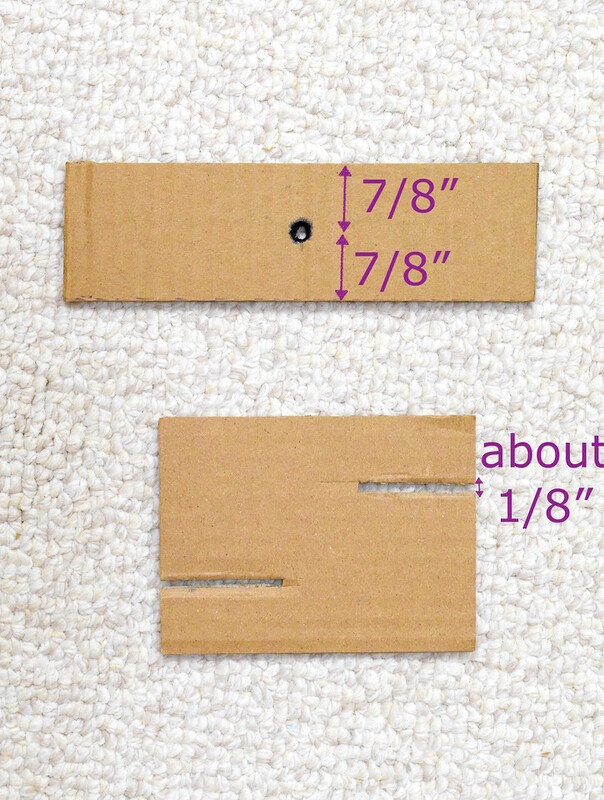 The one in this tutorial was designed to accommodate jumbo craft/popsicle sticks (they're the 6" x 3/4" ones). 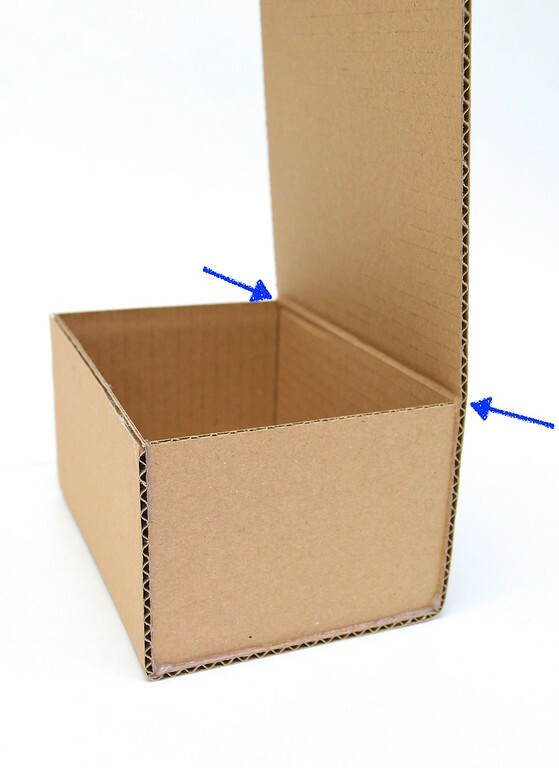 Before we begin the build, allow me to say a few things about tabs (or overlap allowances), which you often see on shipping boxes and cereal boxes and such. 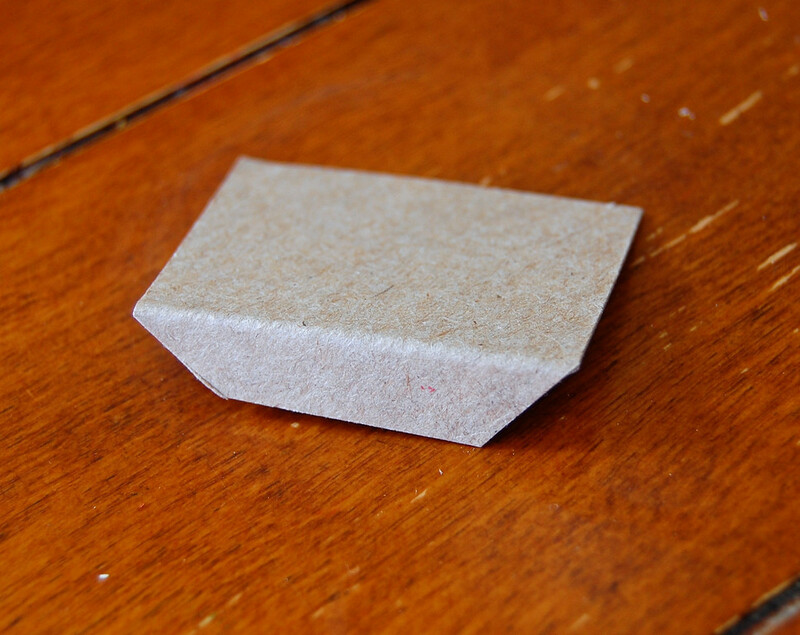 You put glue on them, fold them over and stick one cardboard wall to another. However, if you draft tabs into your template, they are an absolute pain to cut around. Especially if you're cutting out 50 of them by hand. 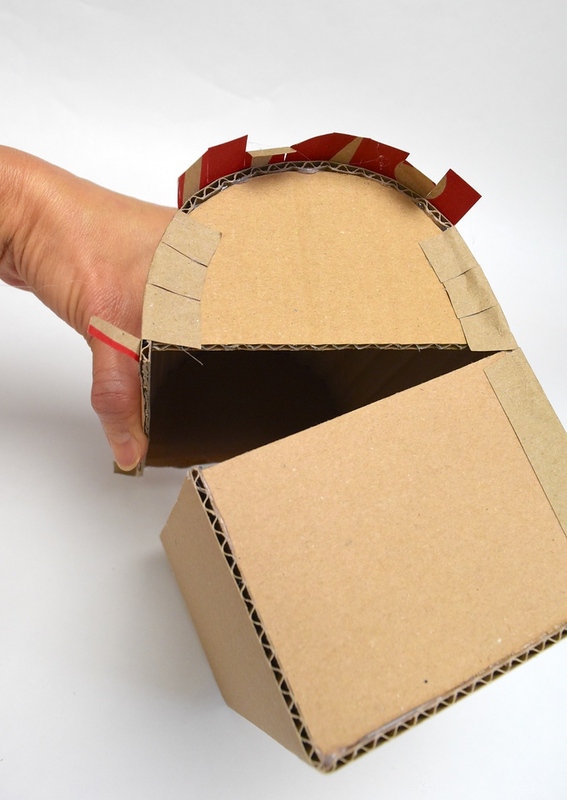 Sometimes we still do add tabs to corrugated cardboard projects for added strength, particularly if these are large structures. 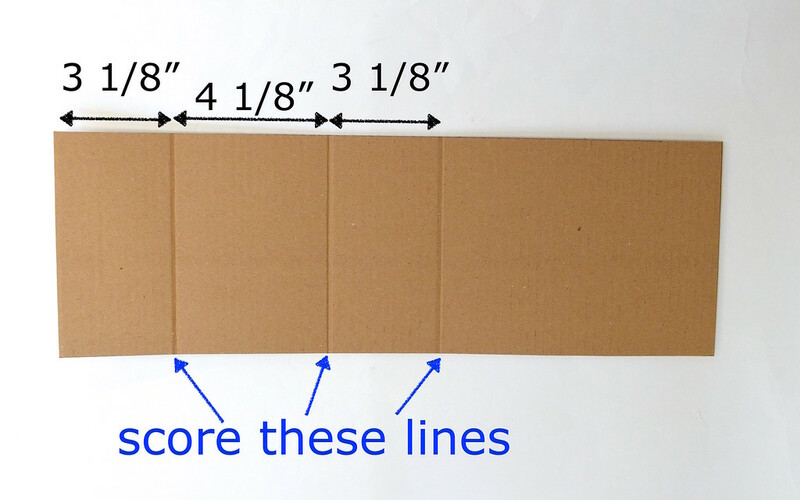 Follow the instructions in the printout to cut these five pieces out of corrugated cardboard. It is imperative that you cut the body-and-lid piece with its shorter sides parallel to the flutes. 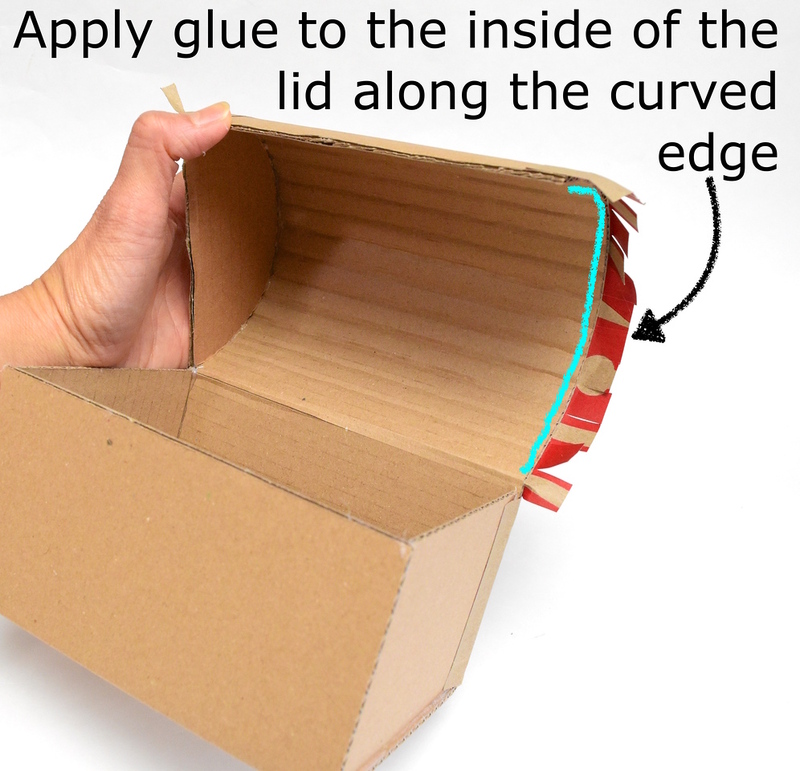 This will allow you to curve the lid easily. With the smaller pieces (the body sides and lid sides), the flute direction doesn't matter as much. 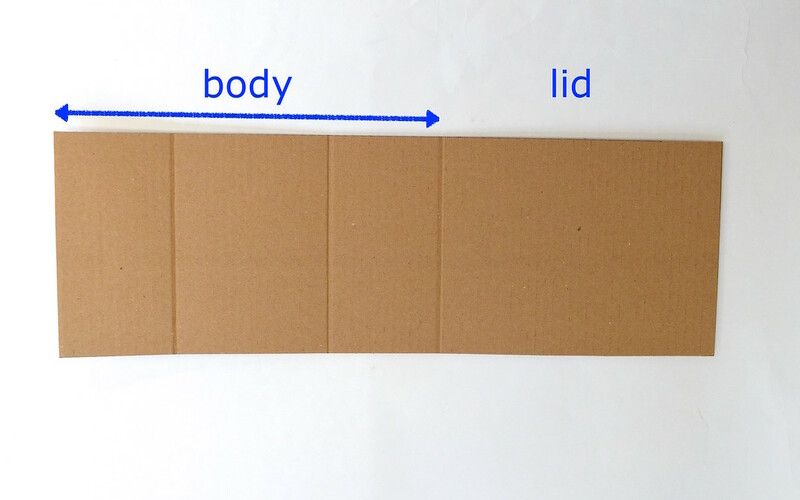 This photo might help you visualize how that long piece fits into the structure of the chest. You'll need to score fold lines along this long piece. 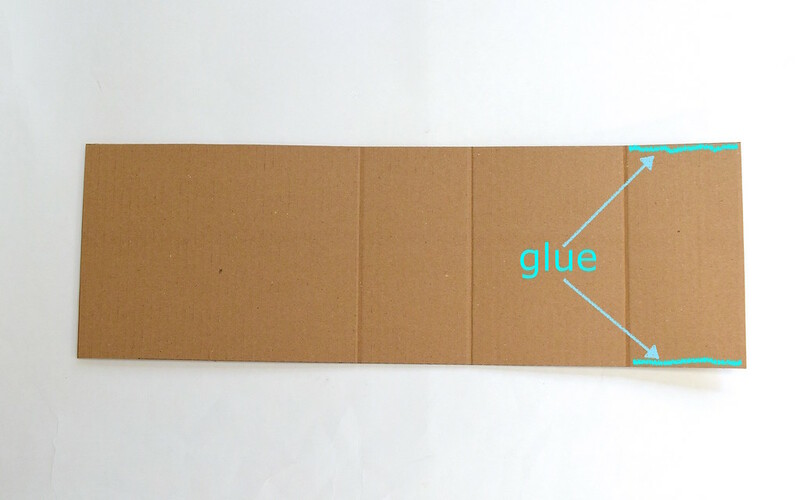 Using the picture below as a guide, measure from one end the distances indicated and make score lines on the surface of the cardboard that will be the interior of the chest. 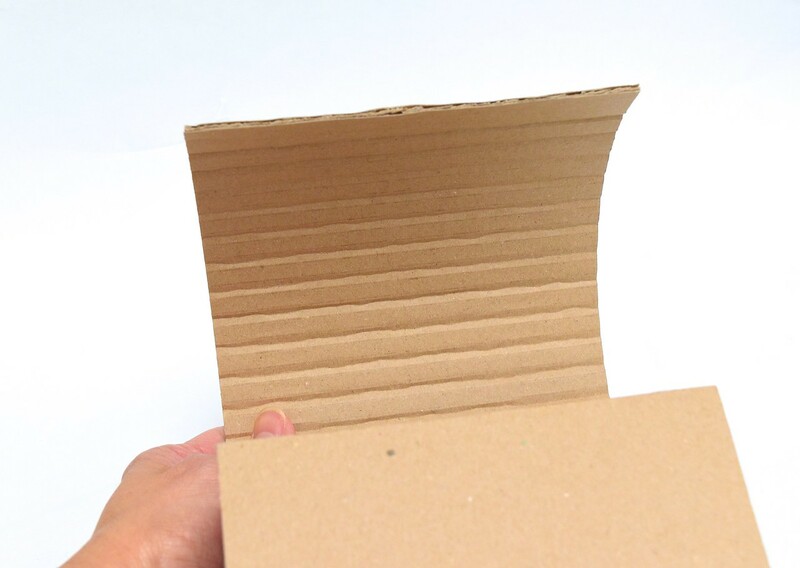 Bend the piece of cardboard inward along those fold lines and then flatten out again. If you are unfamiliar with scoring, this post might be helpful. Note that these dimensions almost match the 3" x 4" dimensions of the rectangular body side pieces, except we've added 1/8" to each. 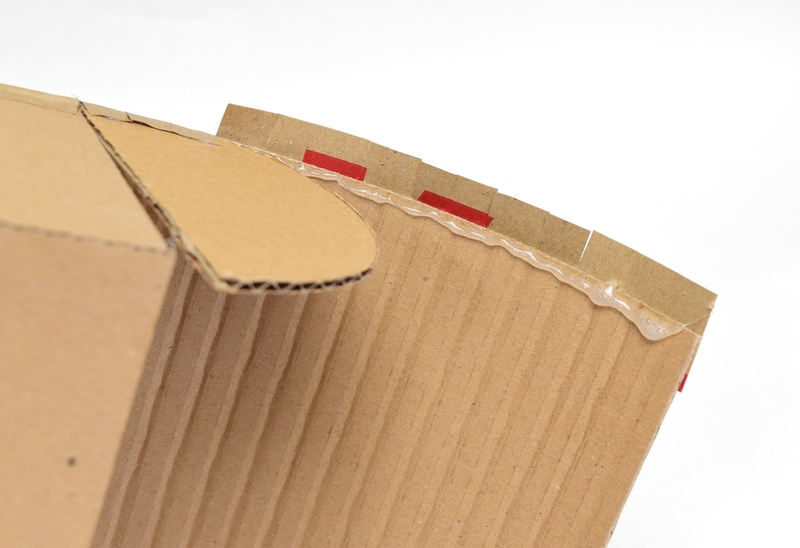 This additional 1/8" corresponds to the thickness of this corrugated cardboard we're using, and it allows the body piece to wrap around the edge of the side pieces comfortably without crowding. You will see this in Steps 2-3. 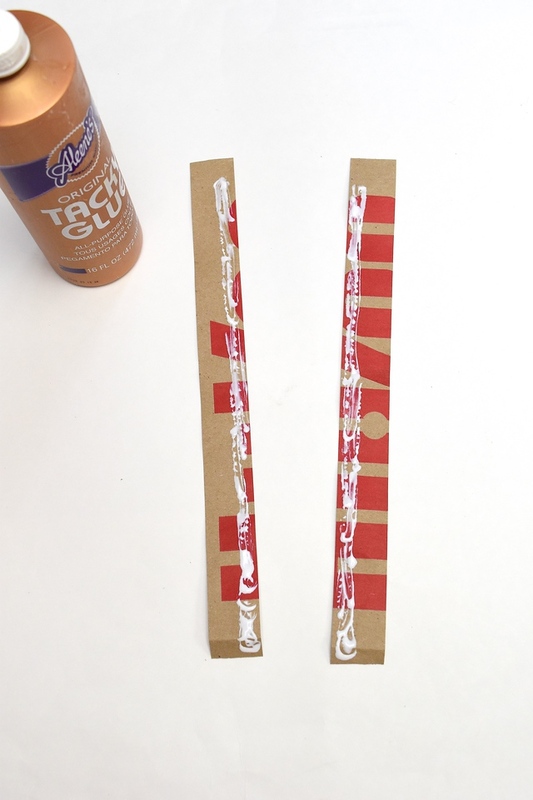 Heat up the glue gun and apply a line of hot glue close to each short edge of the first 3 1/8" section as shown. 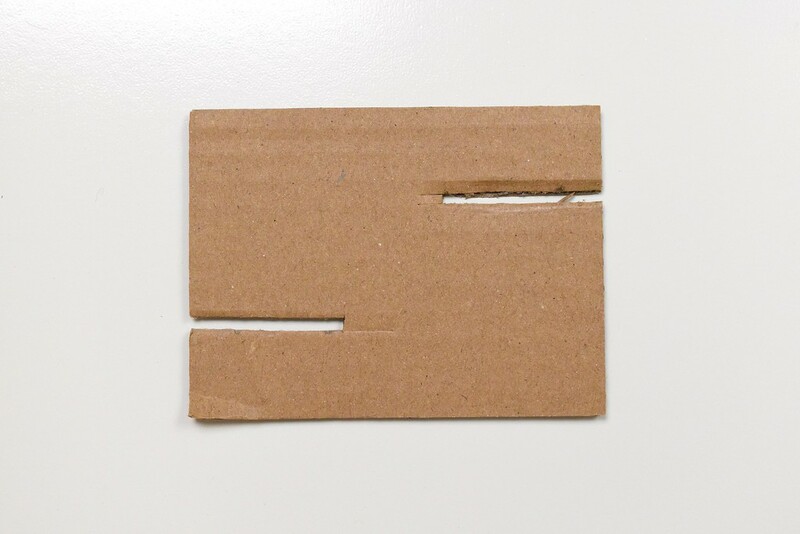 Immediately press the short (3") edge of the rectangular side pieces onto the glue, so they stand upright. 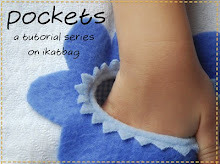 Hold them in place for a few seconds until they can remain upright on their own. 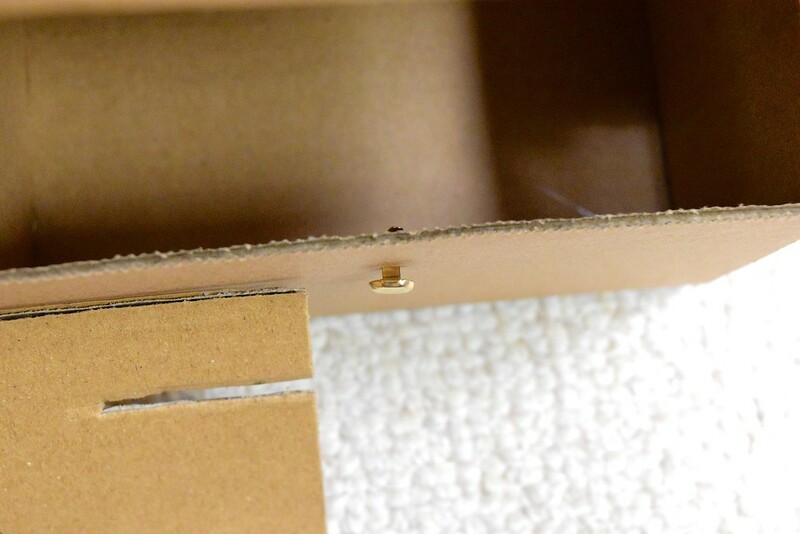 Apply hot glue close to the edges of the 4 1/8" section as shown. 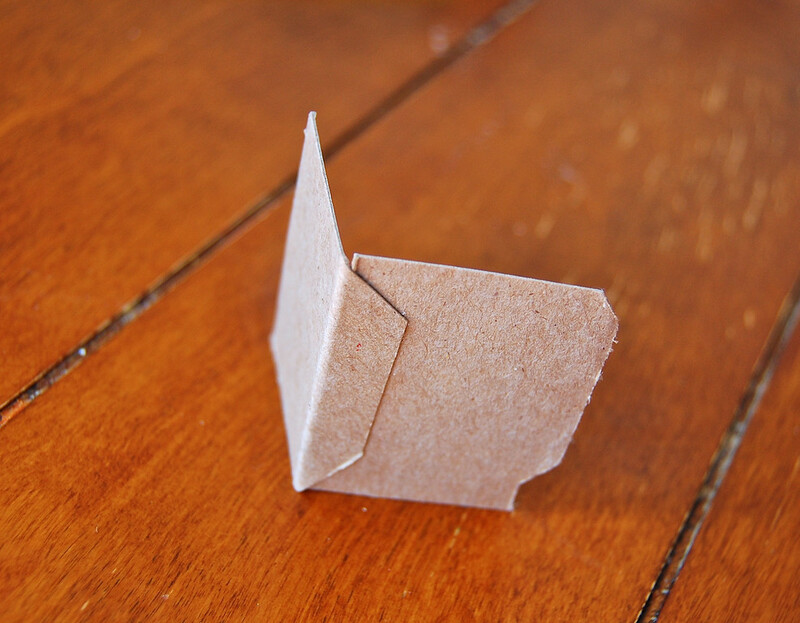 Immediately fold the first section over so that the longer (4") edges of the side pieces meet the glue lines. Hold the side pieces down in place in the second section for a few seconds until the glue dries. 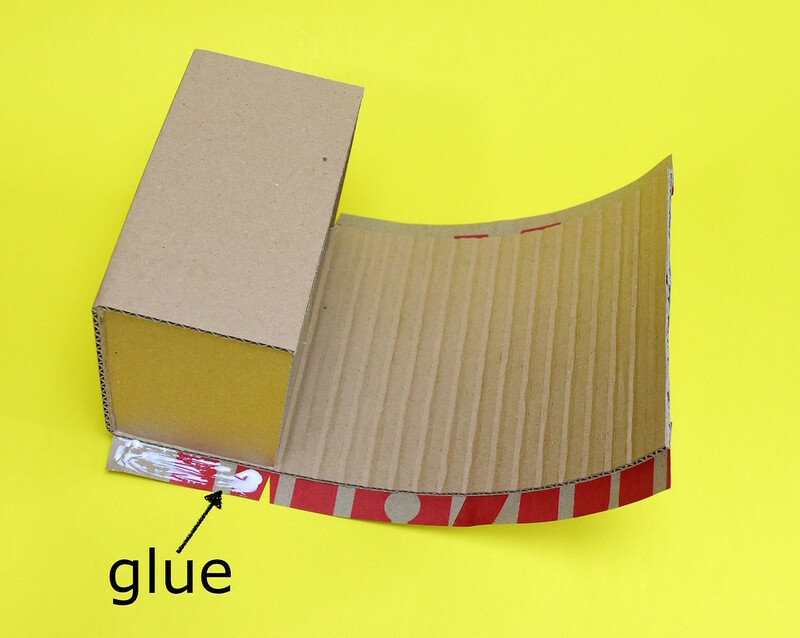 Apply hot glue close to the edges of the third section as shown. Fold the first-and-second sections over so the side pieces meet the glue as shown. Hold the side pieces down in place until the glue dries. This is the body of the chest. Here you can see how the body-and-lid piece has wrapped around the side pieces, and how we've used the thickness of those side pieces for adhesion in place of flaps. Do you see the fold line between the points indicated by the blue arrows below? That's the hinge of the lid and while this structure we've just made is pretty sturdy as is, those two end points will sustain quite a bit of stress as the lid is repeatedly opened and closed. We'll reinforce them in Step 7. We'll form the curved lid now. Stand the chest up as shown. 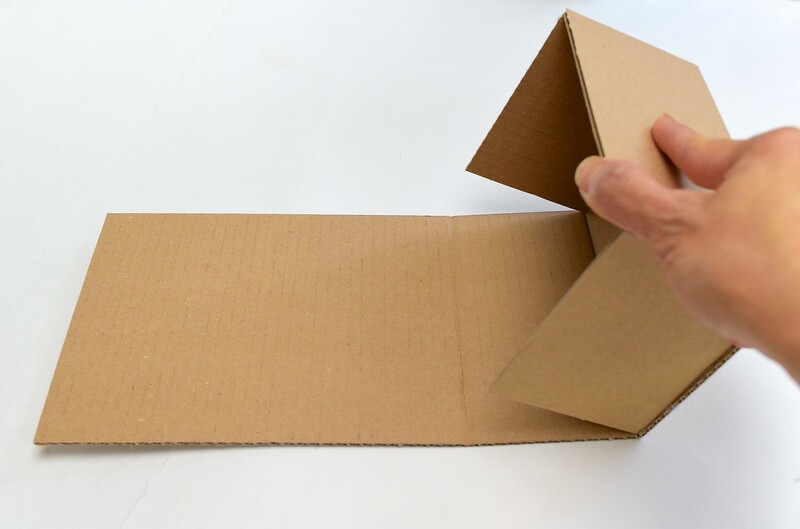 Beginning at the top edge and using both hands, hold the lid on both sides, directly opposite each other and begin bending the cardboard along its flutes.You're only seeing one of my hands in the picture because the other one's holding the camera. Here it's evident why the alignment of the flutes is so important. If you'd aligned the flutes parallel to the long side of the body-and-lid piece, you'd be doing this bending at right angles to the flutes and it'd be a royal mess. 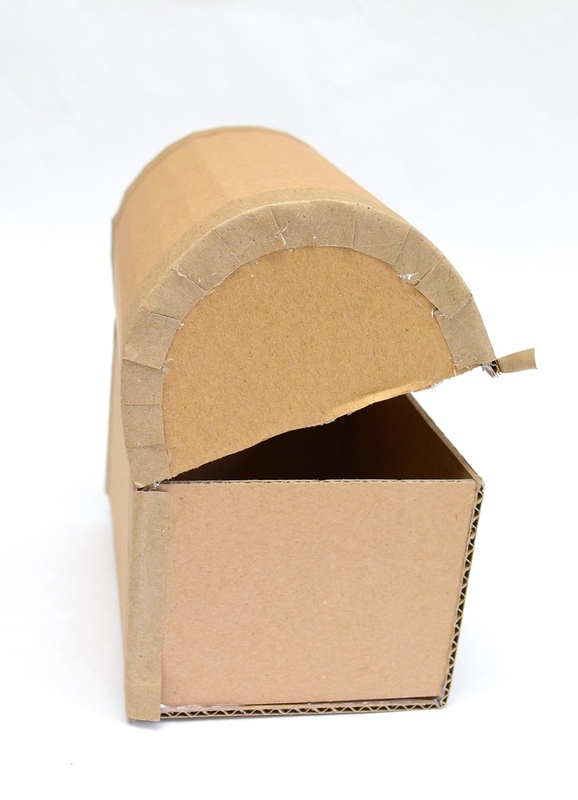 With this particular corrugated cardboard, which was somewhat stiff, I made a bend along every other (alternate) flute. 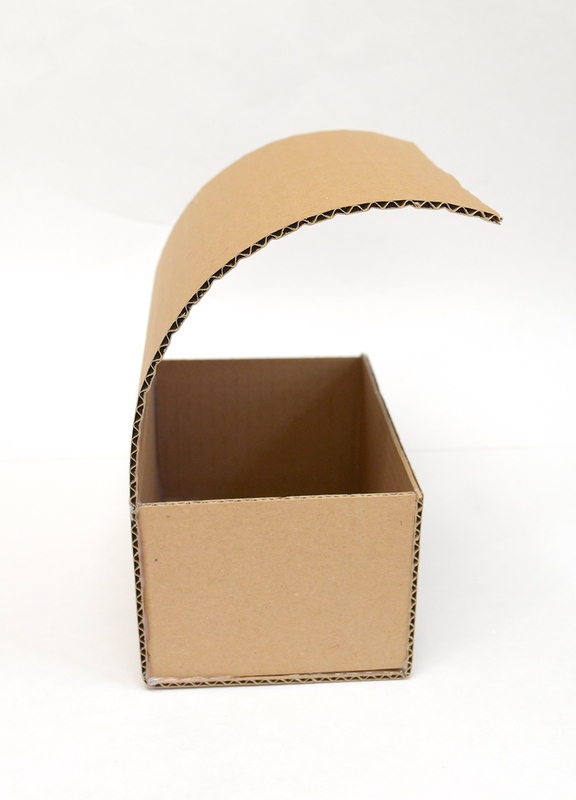 Keep working downward till the entire lid section is uniformly bent. Stop when you reach the hinge where the lid transitions into the body section. The lid portion should look like this when you're done. 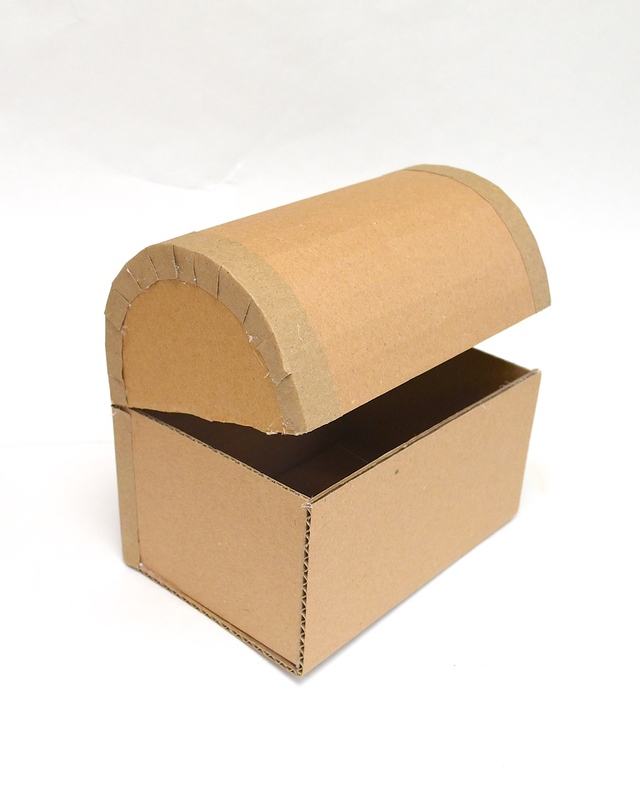 Here is a picture showing chests made with two kinds of corrugated cardboard. 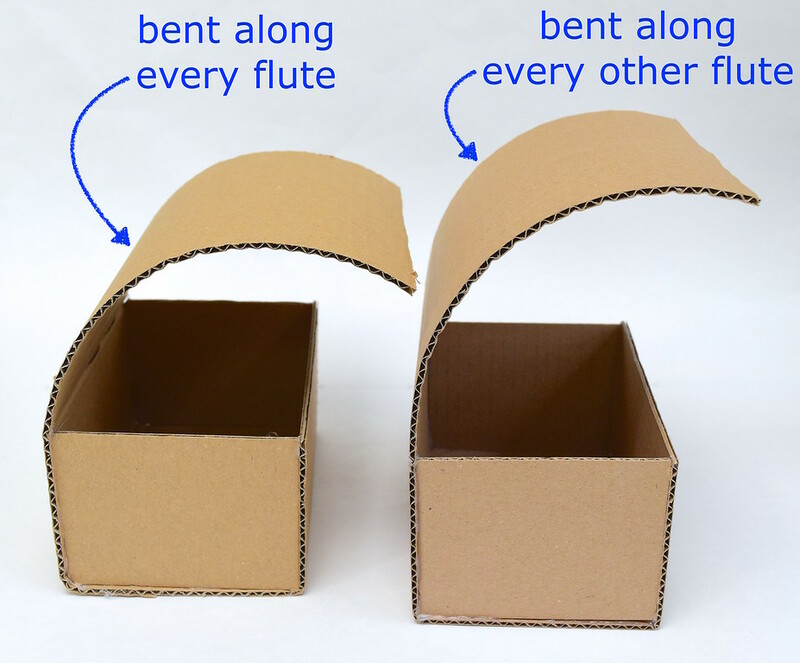 The one on the left is a little more pliable, and I was able to bend the lid along every flute. The one on the right is stiffer and I could only bend it along every other flute. 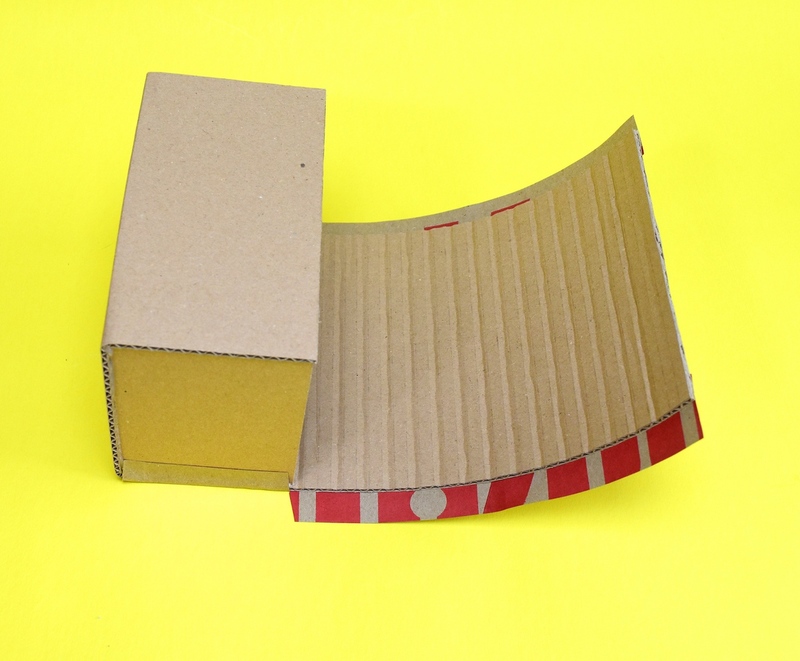 Here's a comparison of the lid sections from the side. 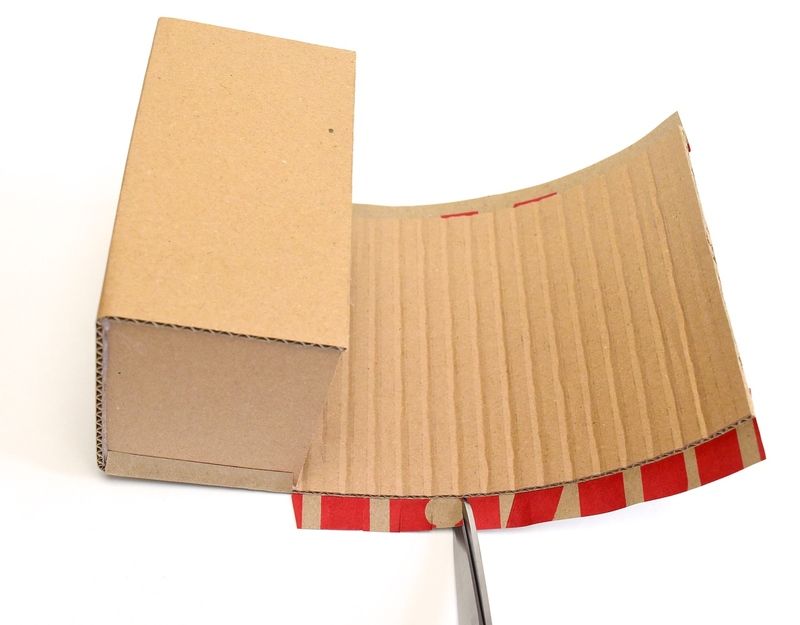 Bending along every flute is ideal because you get a softer curve, which will then wrap more smoothly around the lid's semicircular side pieces. 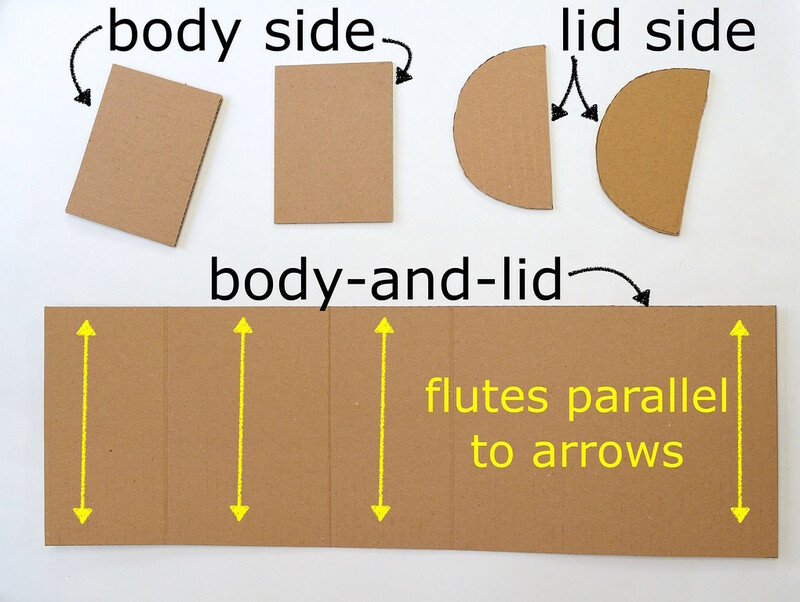 But sometimes the cardboard will not allow a bend along every single flute, and you'll have to do it along every other flute. 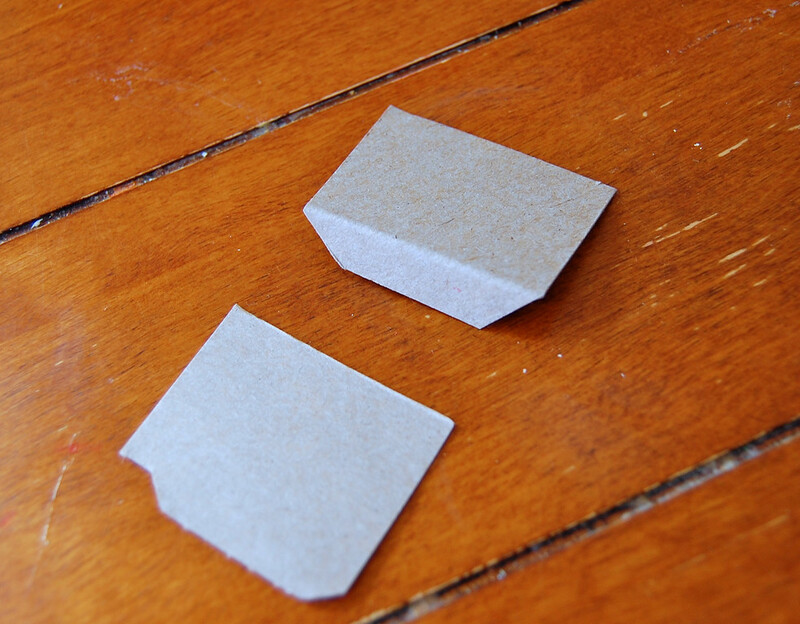 Some of the higher-stress joints and seams will benefit from being reinforced with glue tabs. 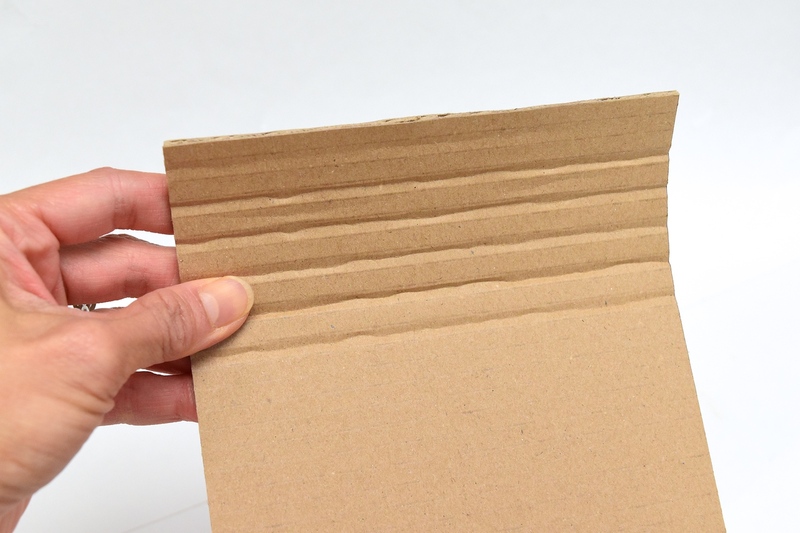 Rather than create tabs from the cardboard itself, which is stiff and bulky, we'll use paper tape. 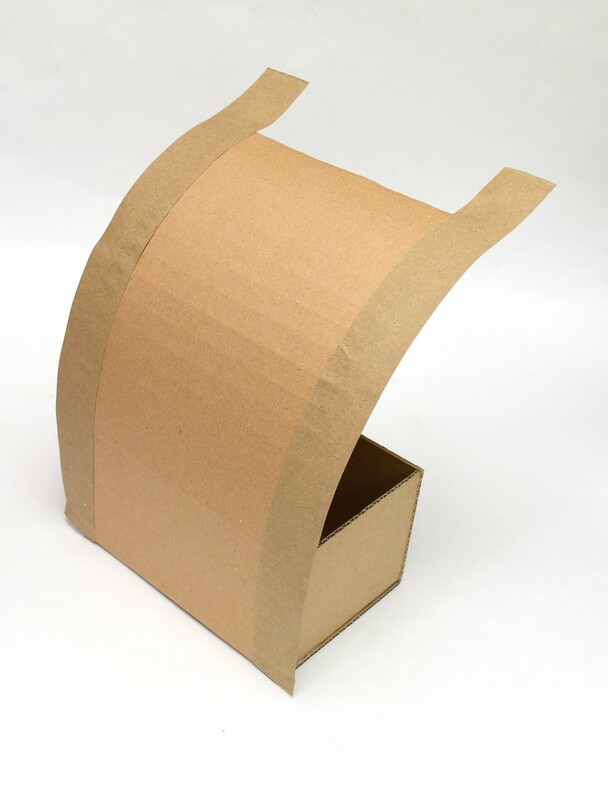 You can buy paper tape or even make it yourself from brand new kraft paper, but you can also cut up a paper grocery sack for the same effect. I cut mine into strips that were about 12" long and 1" to 1-1/4" wide (exact dimensions not important). Apply glue along one half of the back side of each strip, all along its length as shown. I recommend tacky glue or UHU glue as they dry fast but not as fast as hot glue, allowing you some wiggle room to reposition pieces if necessary. I do not recommend Elmer's white glue - or knockoff versions thereof - as it dries too slowly. You'll need two strips per treasure chest. 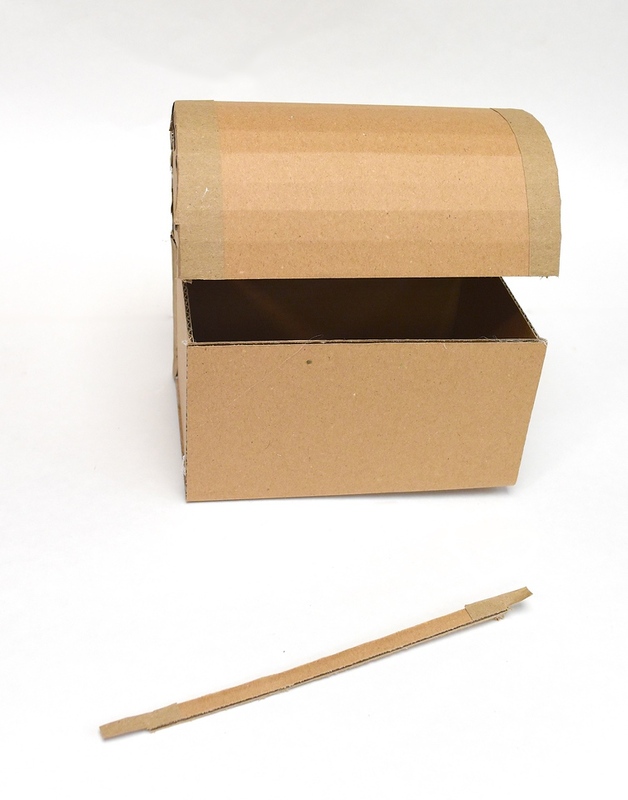 Stick the paper strip along the back of the treasure chest as shown. 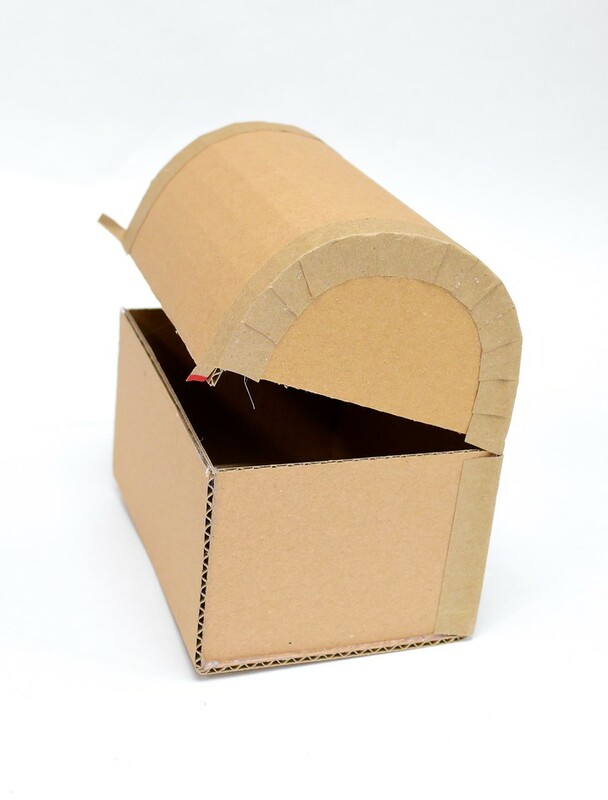 Start from the body of the chest where it sits on the ground and adhere the paper upward along the edge of the curved lid. 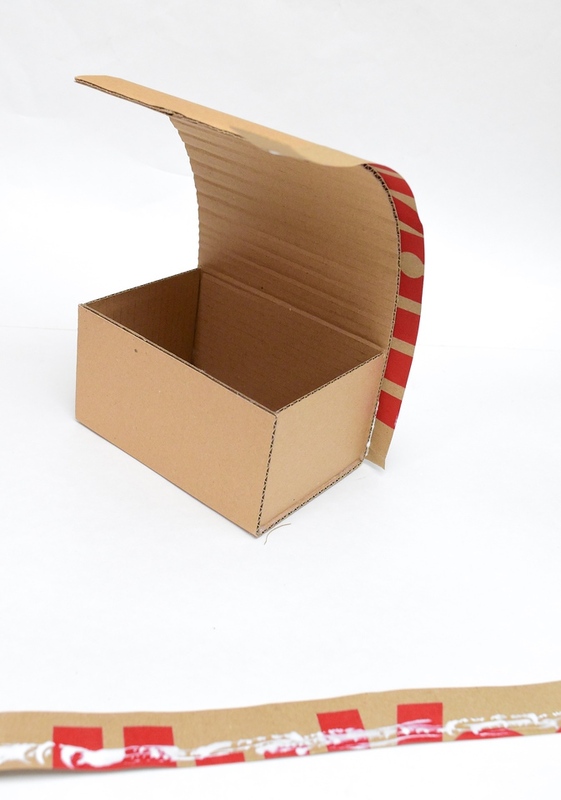 You'll want half the width of the paper tape to be glued on, and the other half free. Here's the back view. 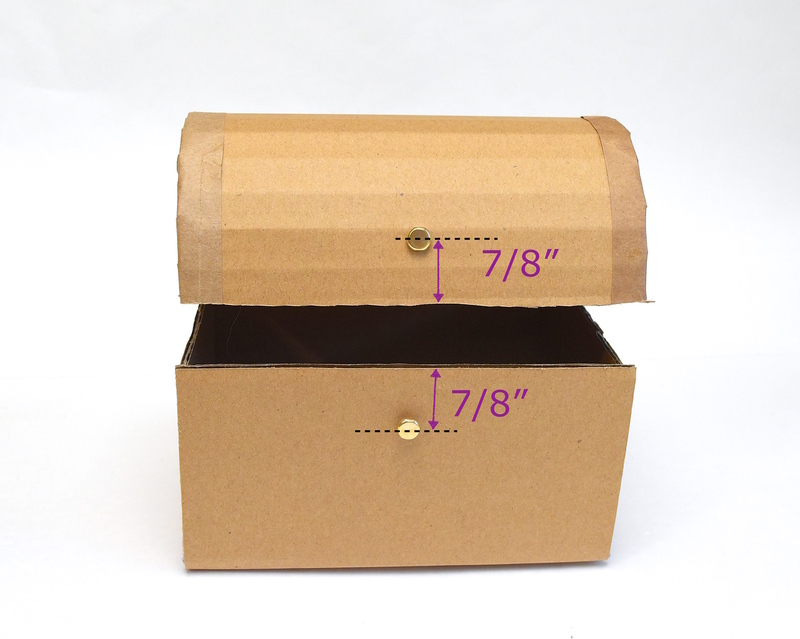 The excess length of the paper tape will extend beyond the top edge of the lid. 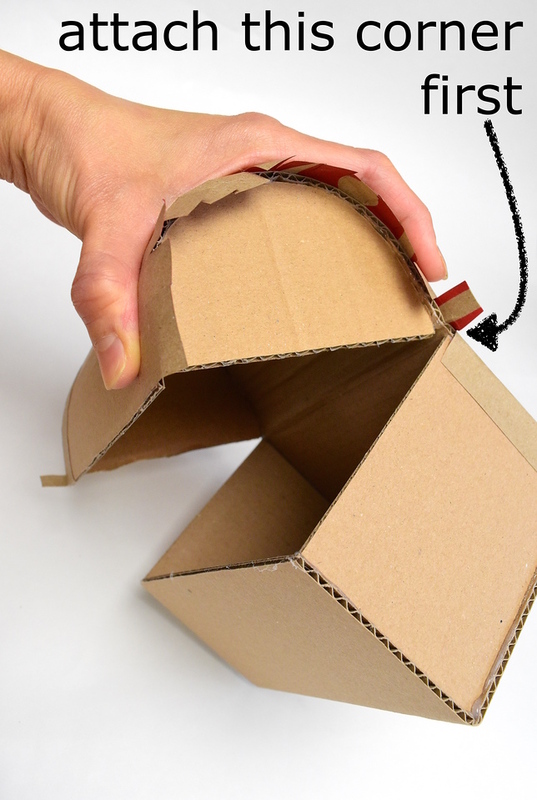 Do the same with the second piece of paper tape along the other edge of the body-and-lid. 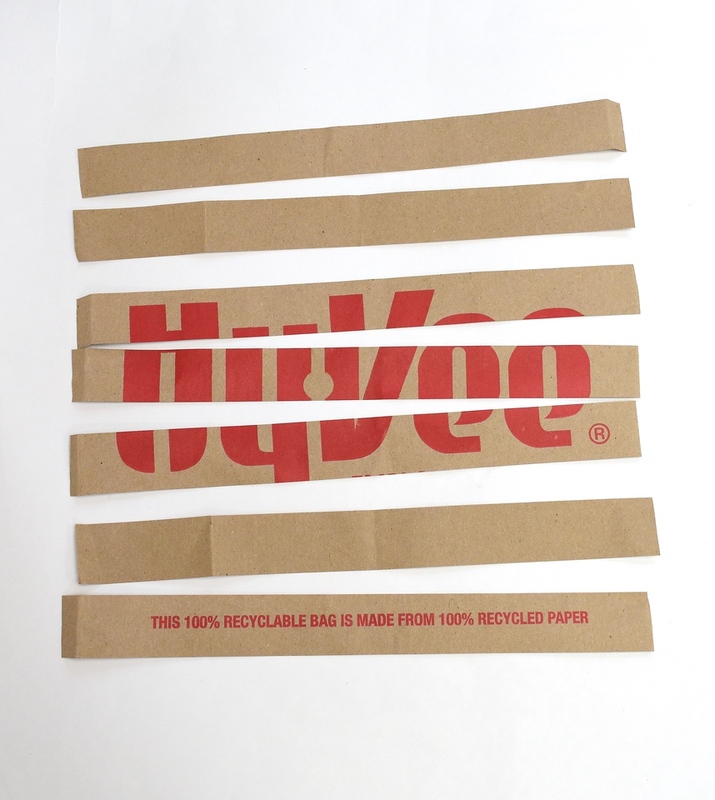 Trim off the excess paper tape. 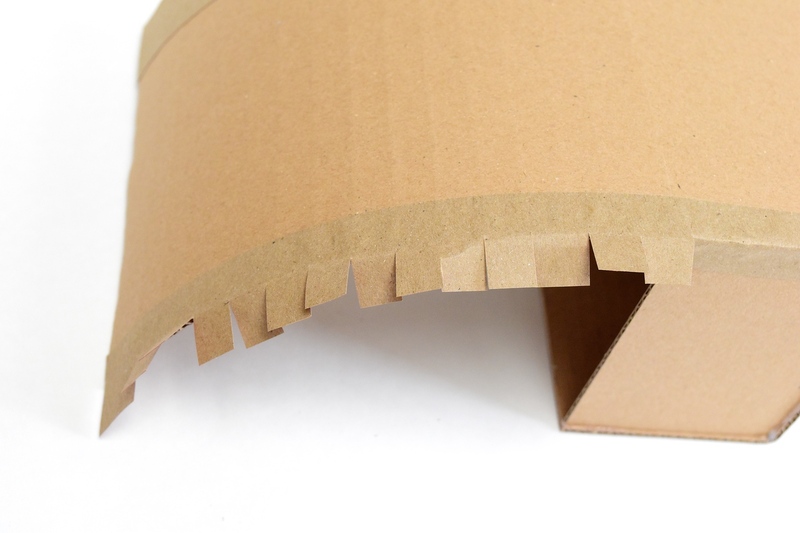 Cut a slit along the paper tape at the hinge line. I've cut an actual notch for visibility, but a slit is sufficient. Apply tacky glue to the back side of the tape in only the section shown. 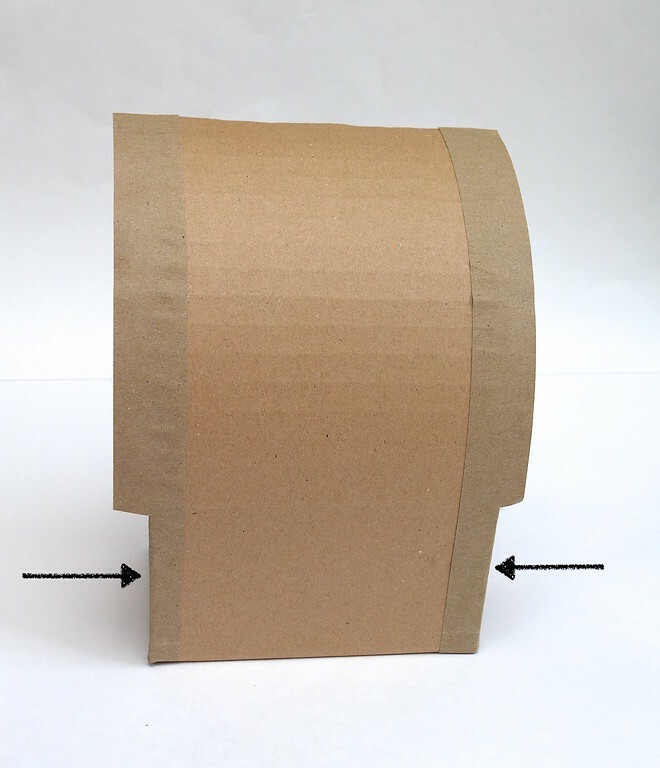 Press that section of the paper tape onto the side of the chest. Remember those blue arrows in Step 3 indicating points of high stress? This tape acts like a tab which reinforces the joint of the walls here and prevents them from coming apart. Do the same with the tape on the other side of the chest. We're going to prep the rest of the paper tape now. 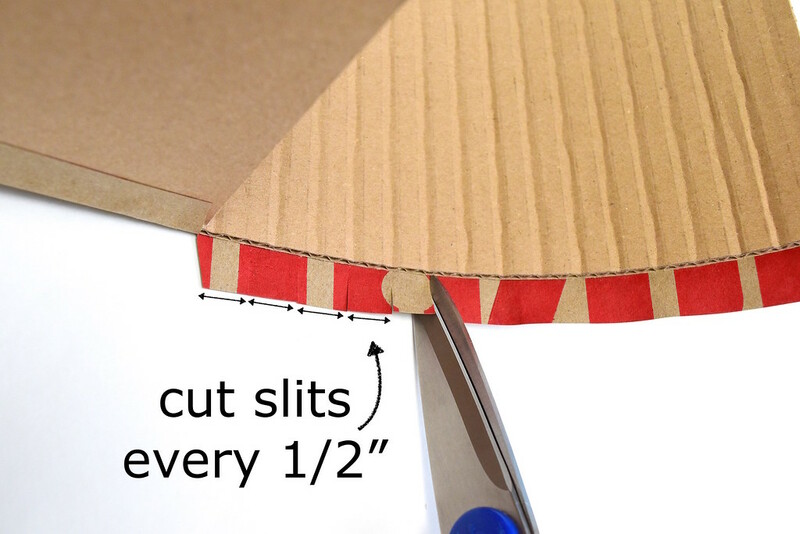 Cut slits every 1/2" - 5/8" along the remainder of the paper tape. Don't measure - just eyeball it. Snip all the way through to where the tape is stuck to the lid. Now comes my favorite part - attaching those semicircular lid side pieces. We need a quick-hold adhesive for this so fire up your hot glue gun again. Be patient and wait till the glue gun is fully warmed up - you'll want the glue to be pretty fluid. Don't use tacky glue for this step because it dries too slowly for what we're about to do (needless to mention, don't even bother with Elmer's white glue). 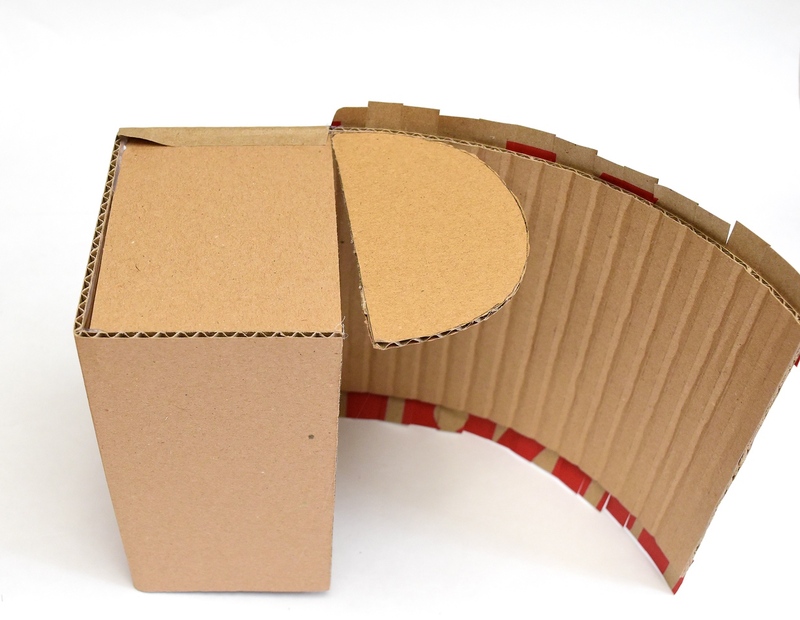 The aim is to have that lid curve around the rounded edge of the semicircular side pieces. There will be resistance, of course, because the lid is a flat piece of cardboard and even with the bent flutes, will want to remain so. We'll work in stages to counteract that resistance - don't be tempted to glue everything at once because the hot glue dries fast and pieces will keep wanting to spring apart from each other. 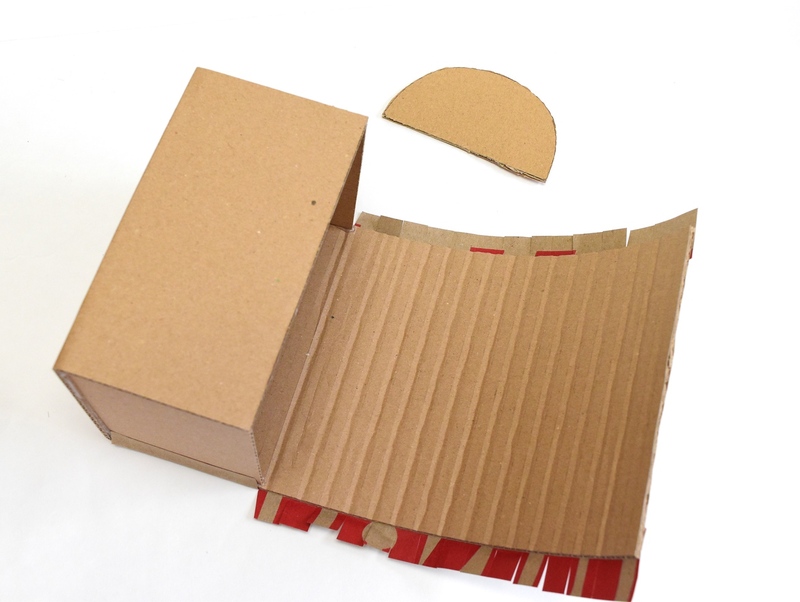 First, apply hot glue on the inside of the lid, close to the edge of the cardboard and beginning at the hinge. Apply just enough to span the first three flaps of the paper tape. 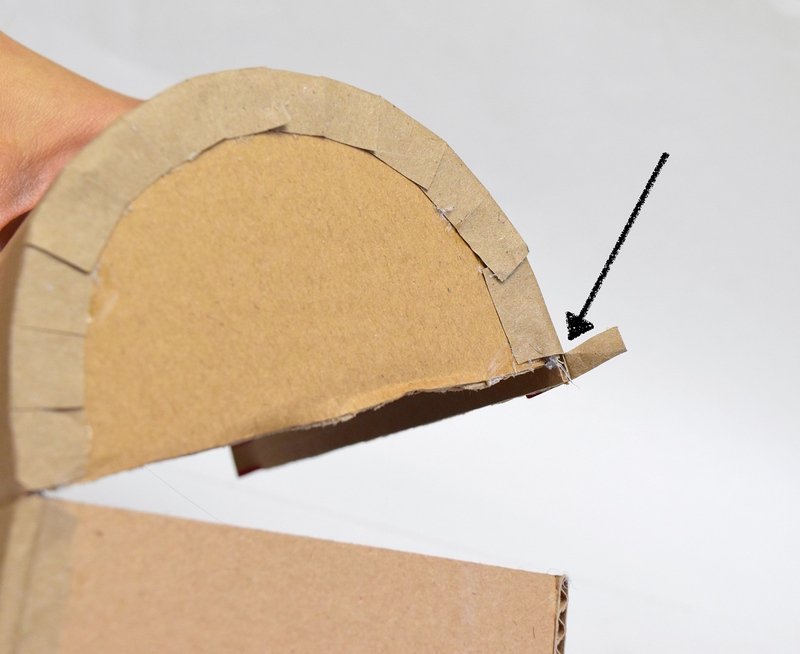 Starting with the corner, quickly press the edge of one semi-circular side piece onto the glue as shown. 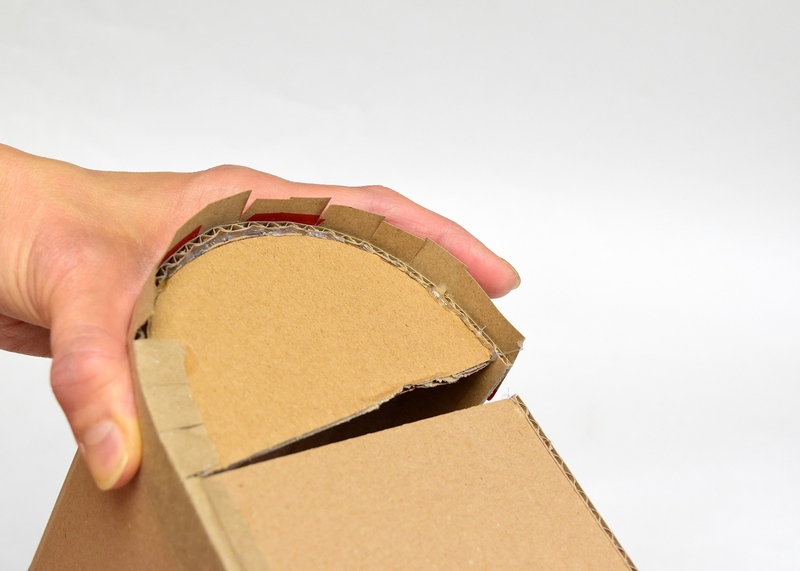 Hold it in place by hand until it's dry (it won't be hot through the thickness of the cardboard). It will probably still be a little wobbly, but the next step will fix that. then quickly press them down onto that semi-circular piece. Again, because the grocery sack paper is pretty thick, it'll only feel warm (but be careful of leaks - those might be hot!) 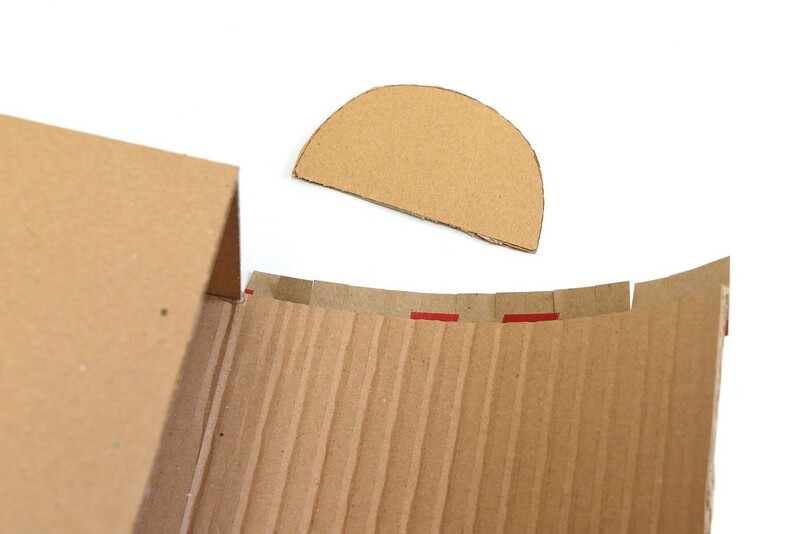 Overlap the flaps as needed to curve around the rounded edge of the semi-circle. Now the semi-circular piece will be a lot more stable. 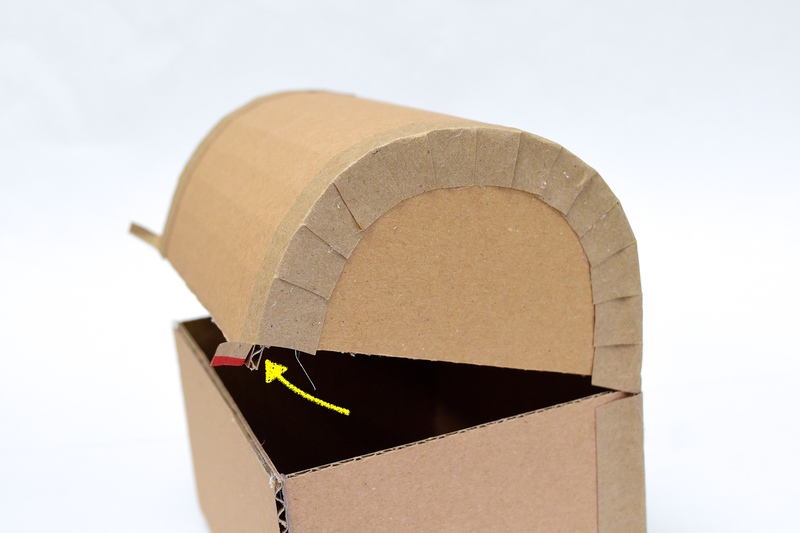 Apply hot glue along the inside edge of the rest of the lid. Yes, do the whole distance. Curve the lid around the rest of the rounded semi-circular edge of the side piece and hold it in place till it dries. 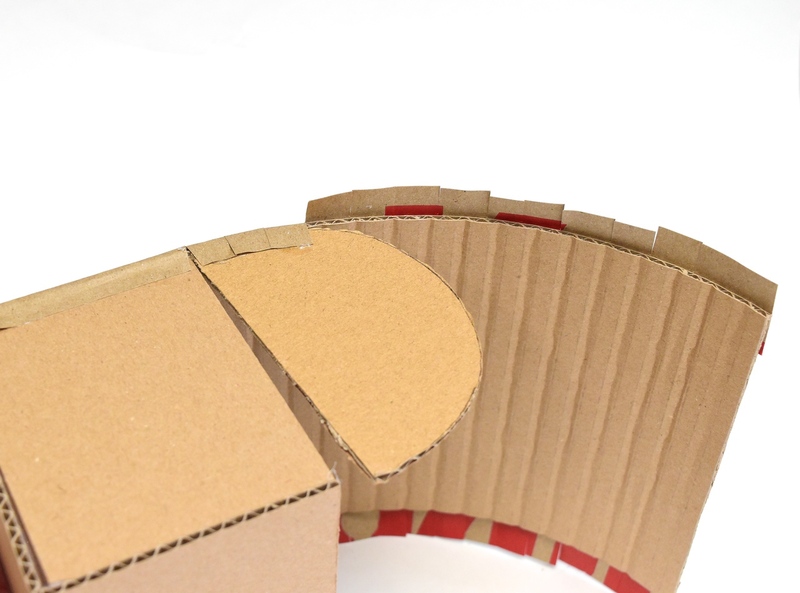 The far edge of the lid will probably protrude beyond the side piece, which is fine - that overhang allowance was deliberately included in the measurement to allow for imprecise alignment during the gluing process. 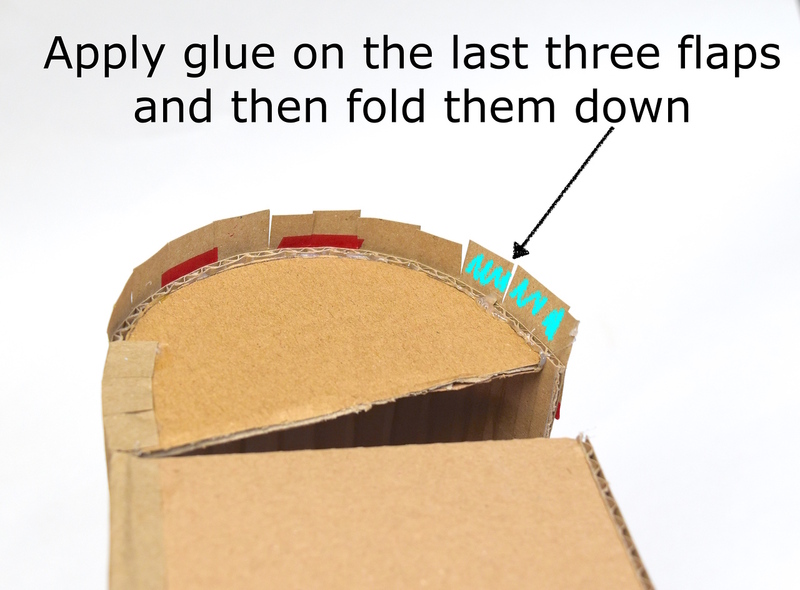 Apply hot glue to the inside of the last three flaps as shown, and fold them down. The whole side-of-the-lid is pretty stable now. 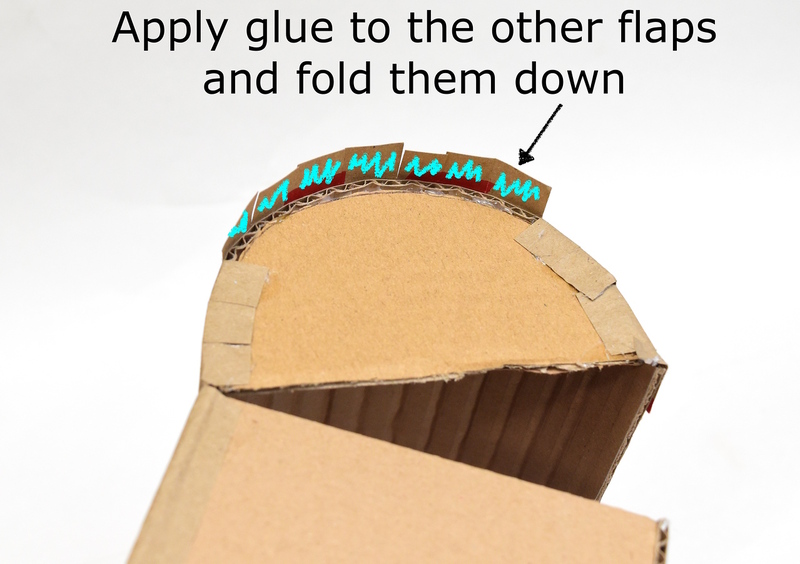 Apply hot glue to the inside of the remaining flaps (I do them in groups of three or four so the glue doesn't dry) and fold them down, overlapping them as needed to accommodate the curve of that rounded edge. Let's talk about that overhang now. 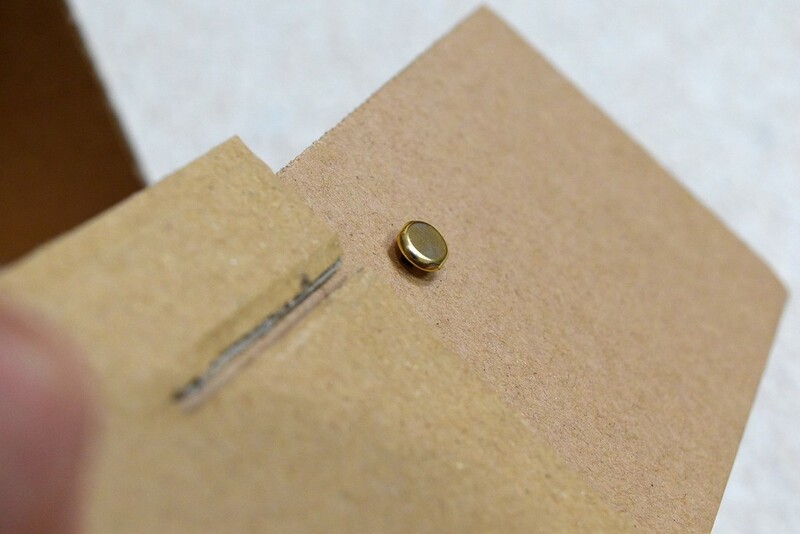 When you're attaching round pieces to flat pieces and working madly-fast with hot glue, you're not going to have the time or luxury to perfectly align, position and reposition stuff. 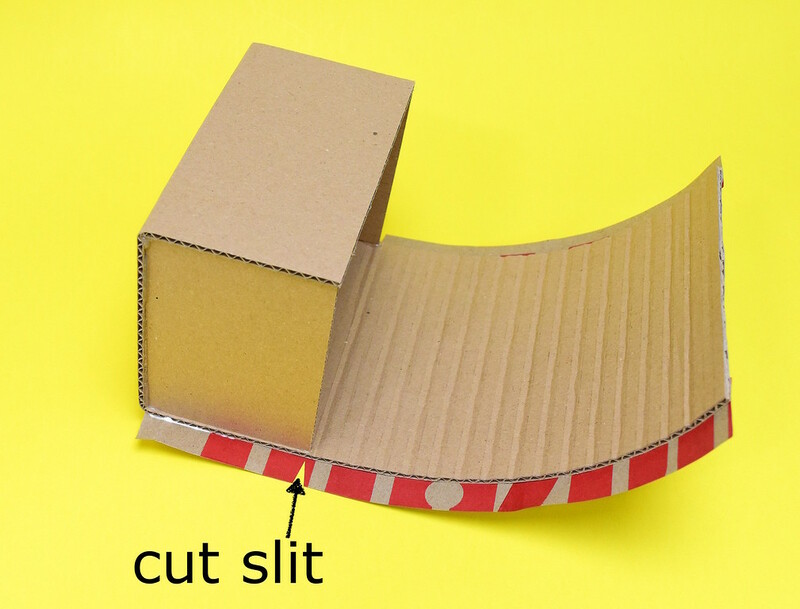 Typically, a seam dries solid in about 3-5 seconds. The lid piece was cut with a little allowance for that. 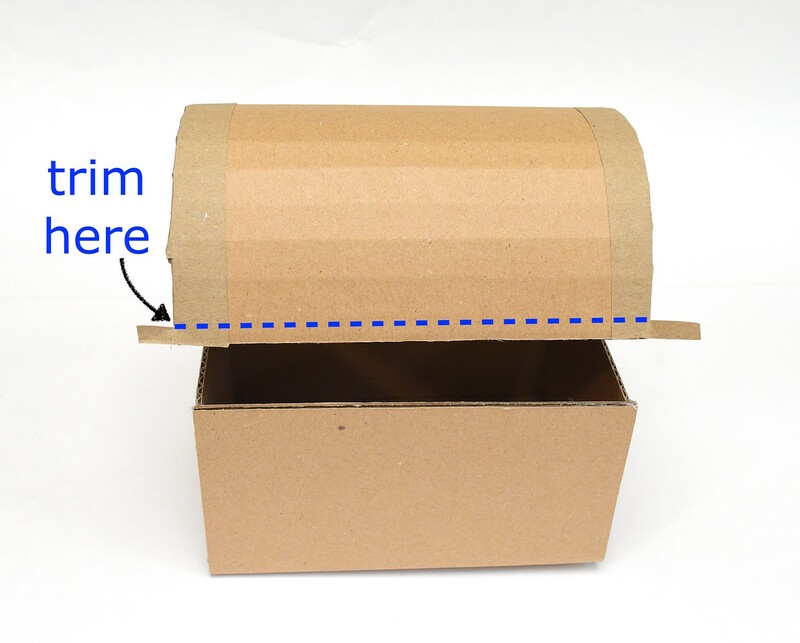 If you're making several of these chests, you might find that this overhang isn't even consistent across the chests, because it depends on how snugly the lid wraps around the side piece each time you do the glue-and-hold process. We can trim this overhang later - a little longer is infinitely better than having it be too short . Now we'll attach the second side piece. 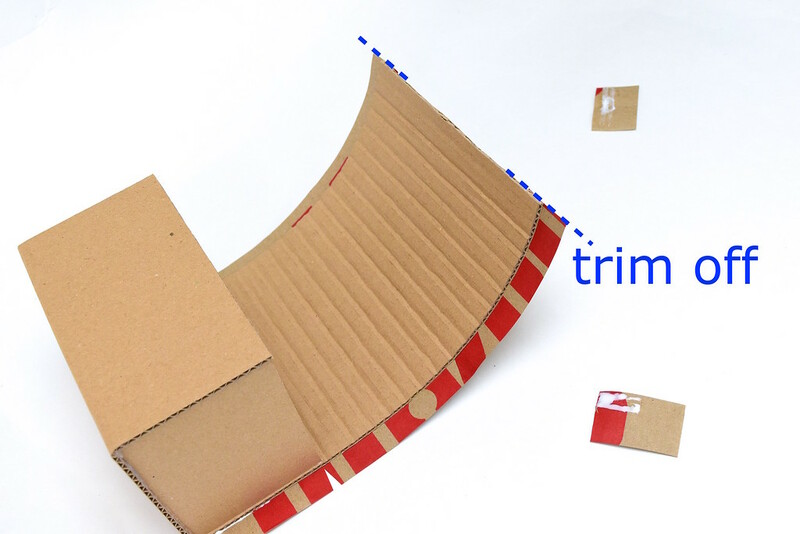 Because the lid is already partially-curved into shape around the first side piece, attaching the second piece will be much easier and you'll encounter far less resistance. 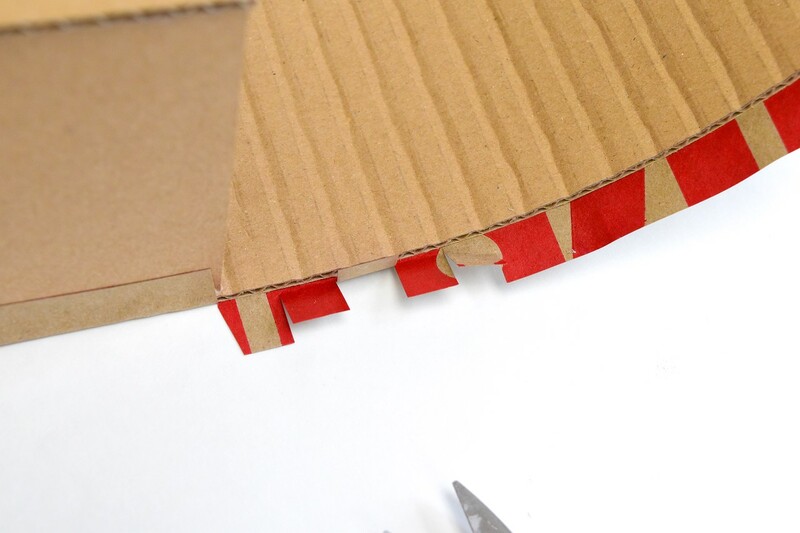 Apply hot glue to the entire length of the inside edge of the lid. 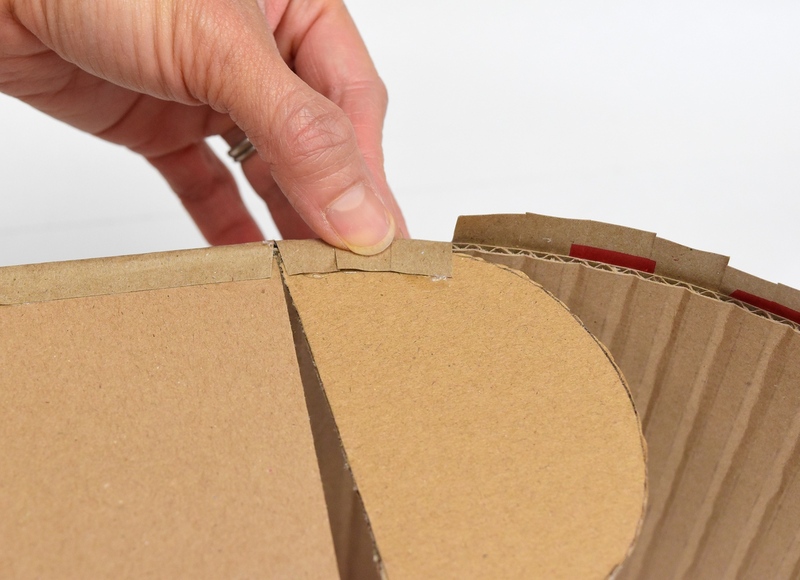 Immediately press the rounded edge of the second side piece into the glue, attaching the corner at the hinge first, and wrapping the lid around the rest of it. Hold it in place till the glue dries. As with the first side piece, glue the flaps down to secure this second side piece. 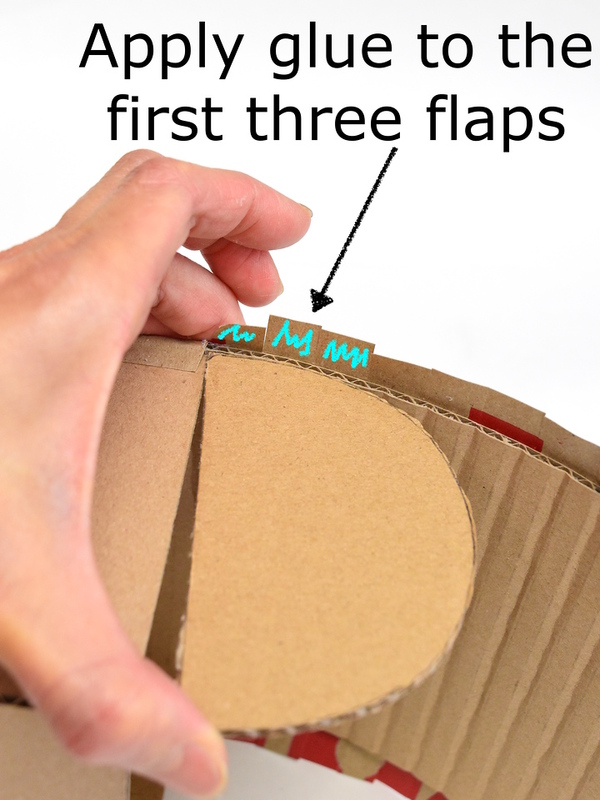 Work with the flaps at either corner first, as this will be where the lid will most try to separate and spring apart. and trim off with a sharp knife. You might notice, however, that the lid "pops" up and doesn't stay shut. 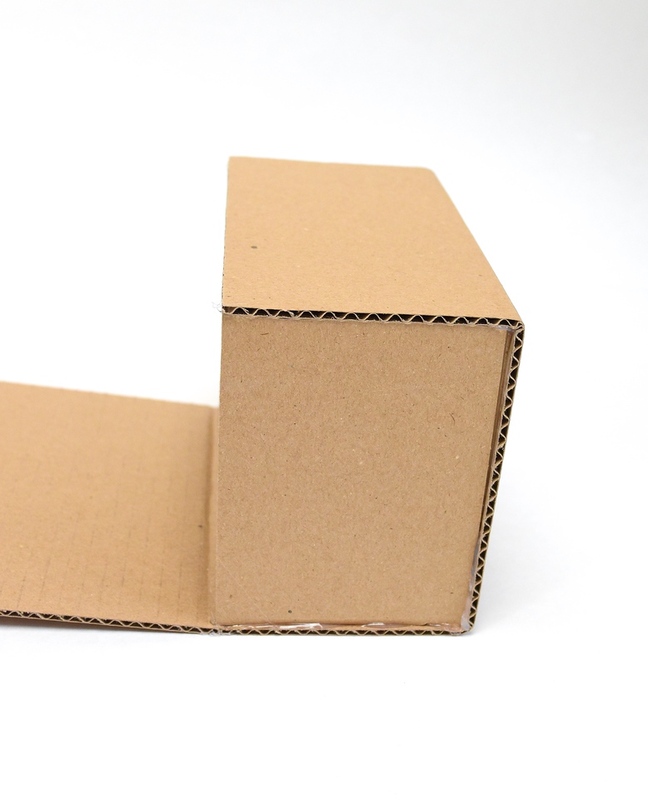 This is because the hinge is merely a fold in the cardboard instead of an actual hinge seam between the lid and the body. 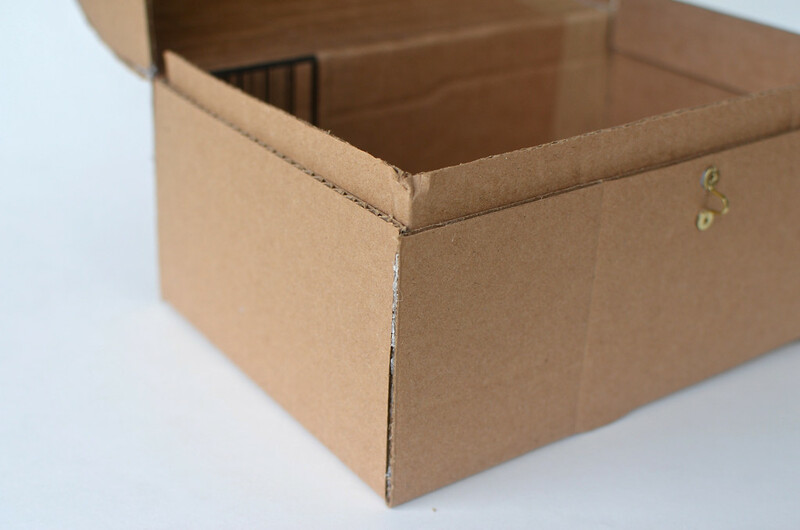 There are several ways to keep the lid from springing back up when shut. Here is one technique from another chest long ago: an inner "lip" around the body that uses friction to create a snug fit. There's also a hasp that will secure the lid once it's closed, but this lip will keep the lid from springing open even without the hasp. 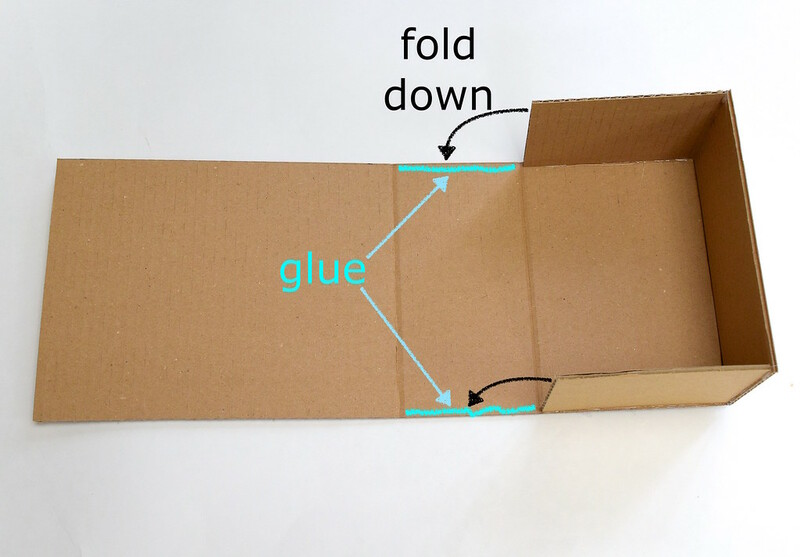 I use this inner-lip-friction method a lot in my cardboard builds, but it does require a precise fit to work, plus the extra steps of slicing strips of cardboard, bending them exactly so, and gluing them to the inside of the box to make that lip. 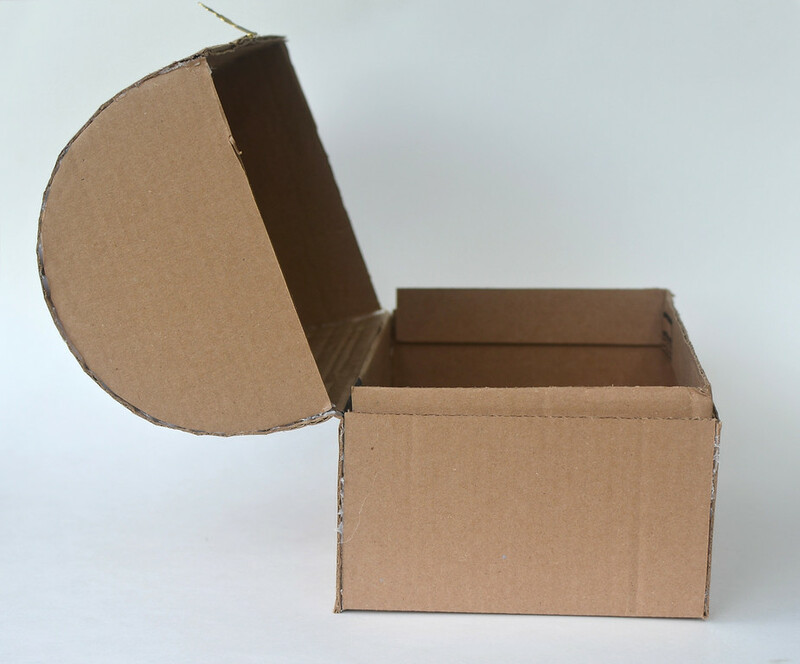 Therefore, this technique is most energy-efficient when making just one or two items when you can take the time to ensure that fit. 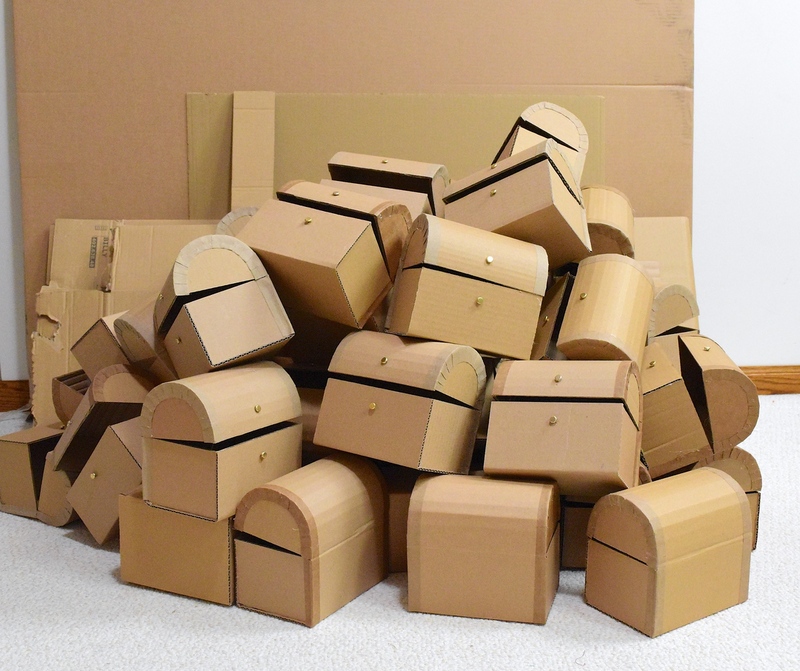 When you're mass-producing 50 chests, we need a simpler (and less time-intensive) alternative. 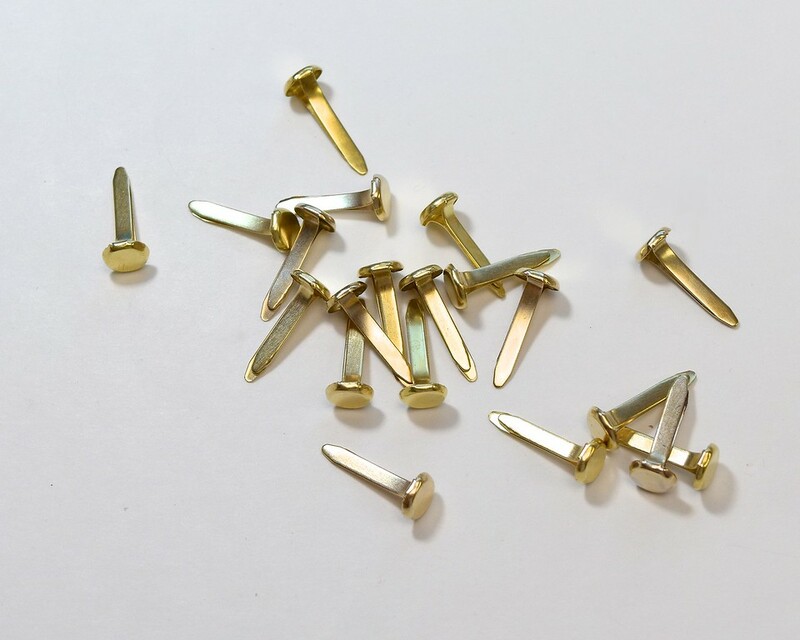 Enter paper fasteners. and the lid stays shut. 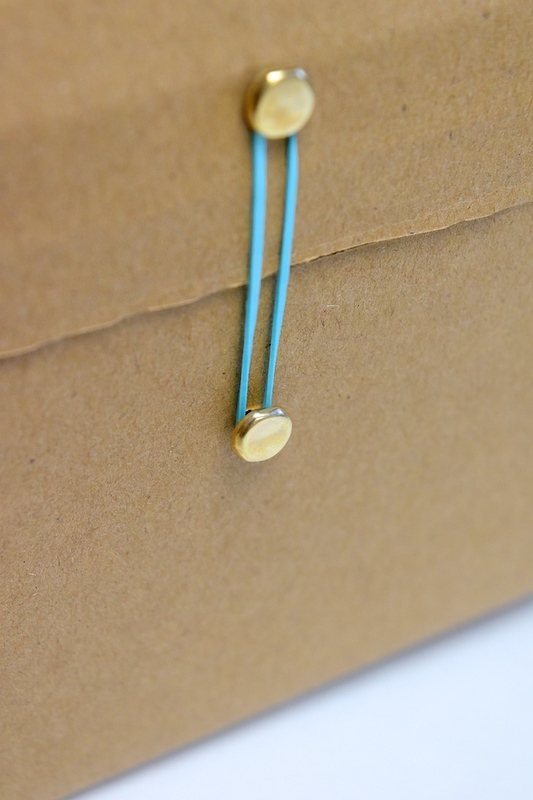 Easy for little hands to do (although the littlest hands will need help installing those paper fasteners). 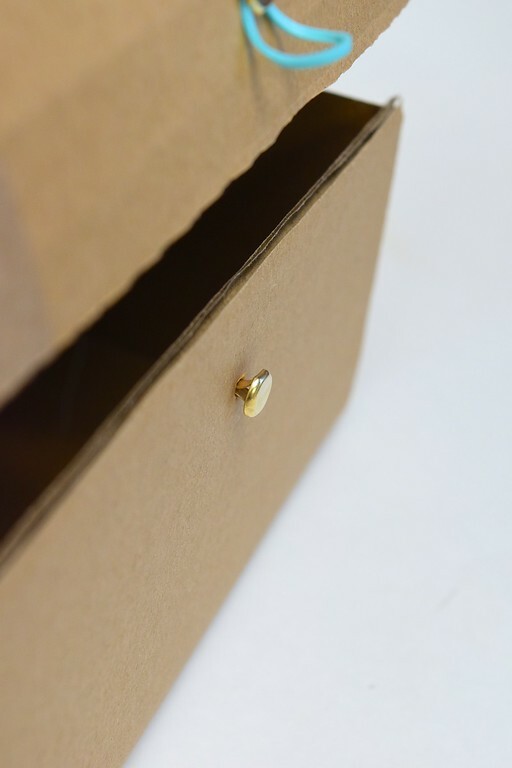 If this is the end-point of your build, the actual position of those paper fasteners won't be important - as long as they're centered, and separated sufficiently far apart for the tension in the rubber band to keep the lid shut. 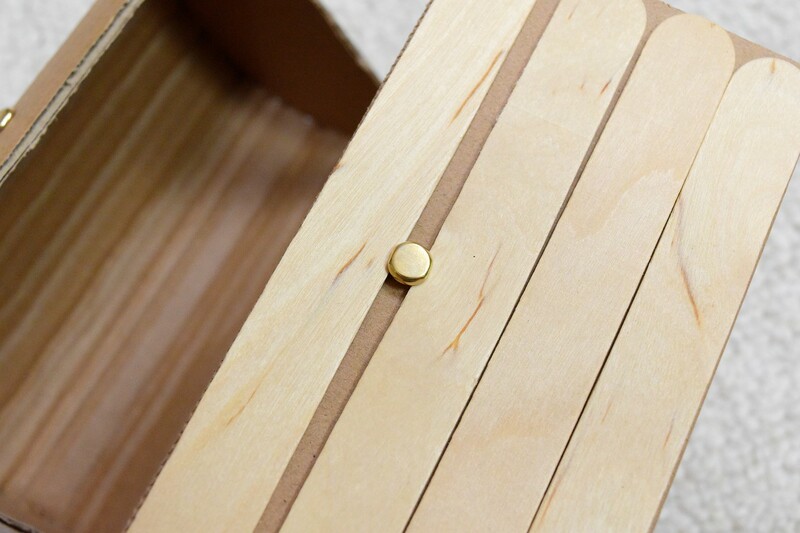 Our chests were designed to be embellished with jumbo popsicle sticks, so those studs had to be placed where they could accommodate the width of those sticks. This is a separation that worked for us. 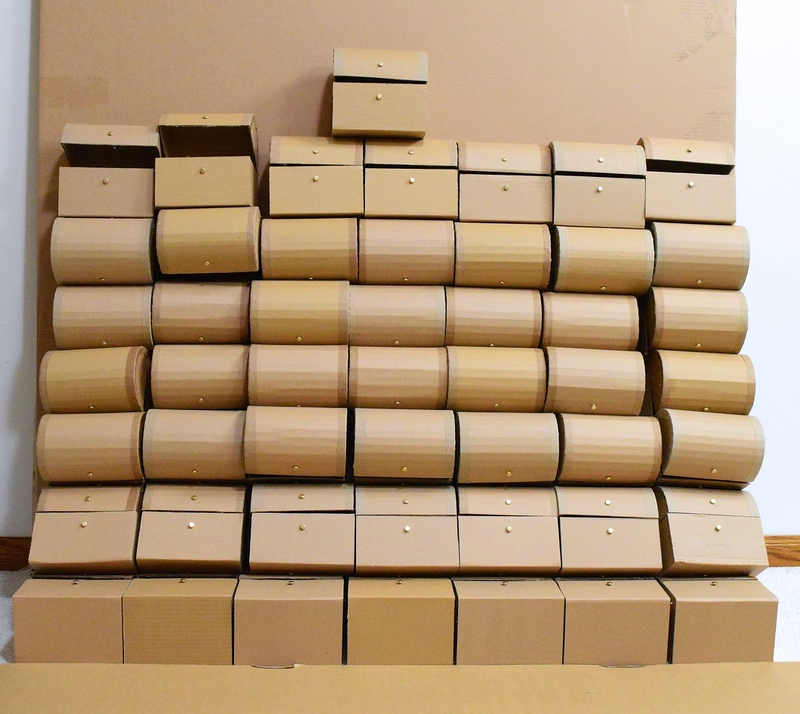 Manually measuring and centering 100 paper fasteners for 50 chests could get tedious, so I made these 2 cardboard aids. 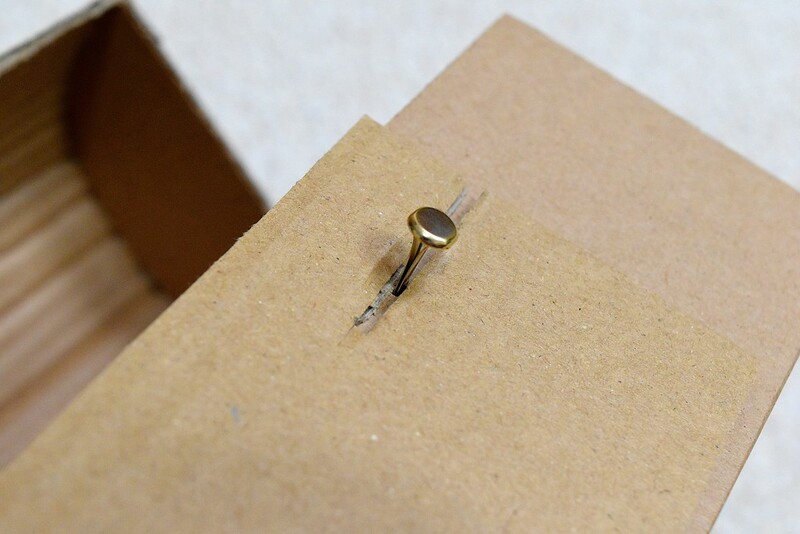 The one with the hole is a template for marking the position of the insertion points for the paper fasteners. It's exactly 6" long, so aligning it along the edge of the lid and the body will allow you to mark a central spot 7/8" from either edge. It made quick work of marking those 50 chests! 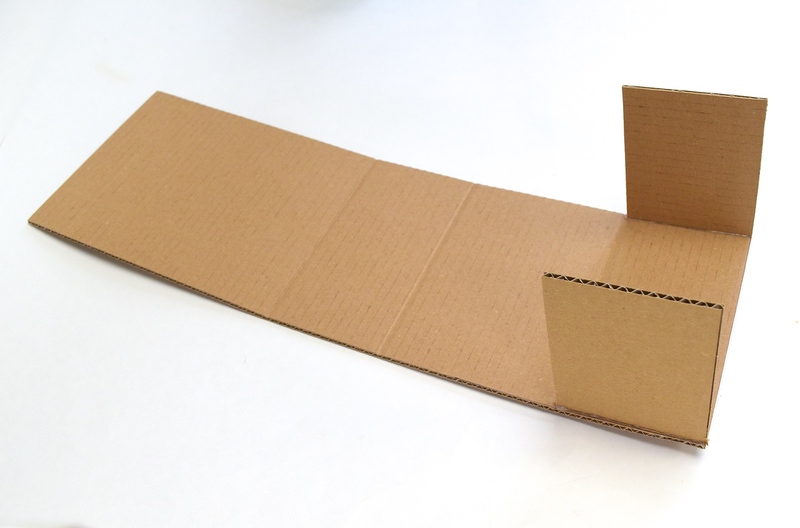 Here's how I used the other cardboard aid. 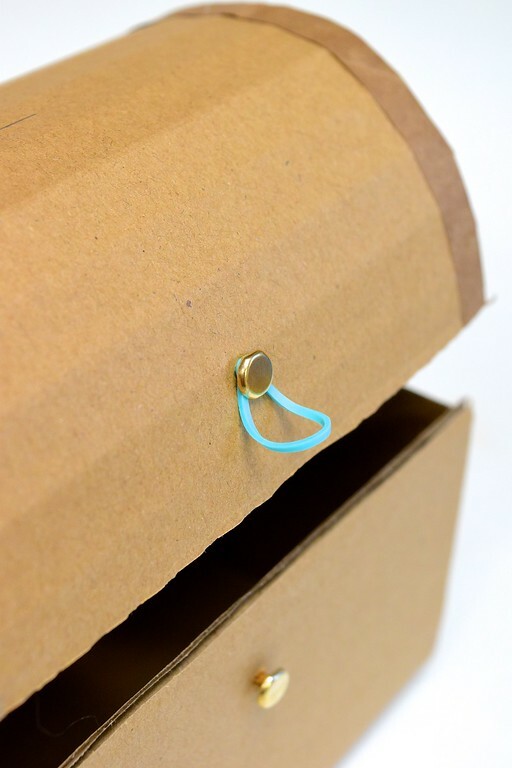 Remember the paper fastener on the body of the chest that had to stick out enough for the rubber band to loop easily and repeatedly around it. 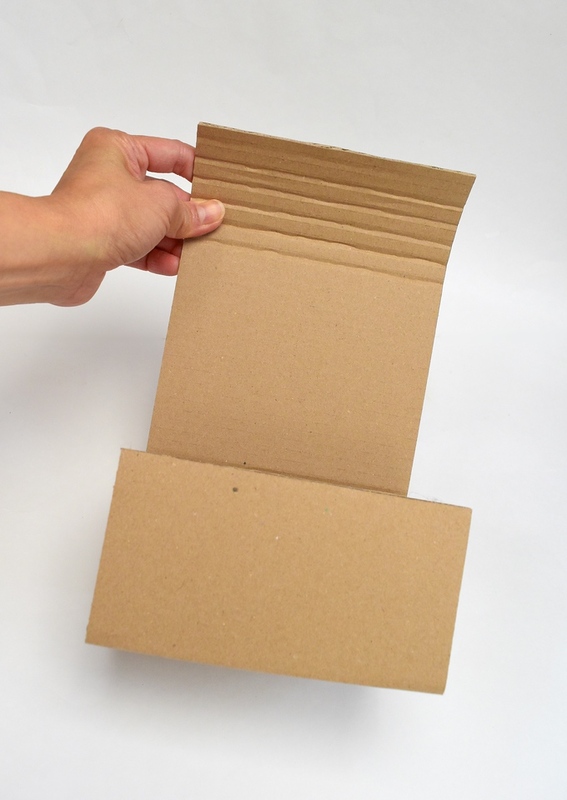 This cardboard aid has a slit through which the paper fastener's prongs can slide when you insert them into the chest. 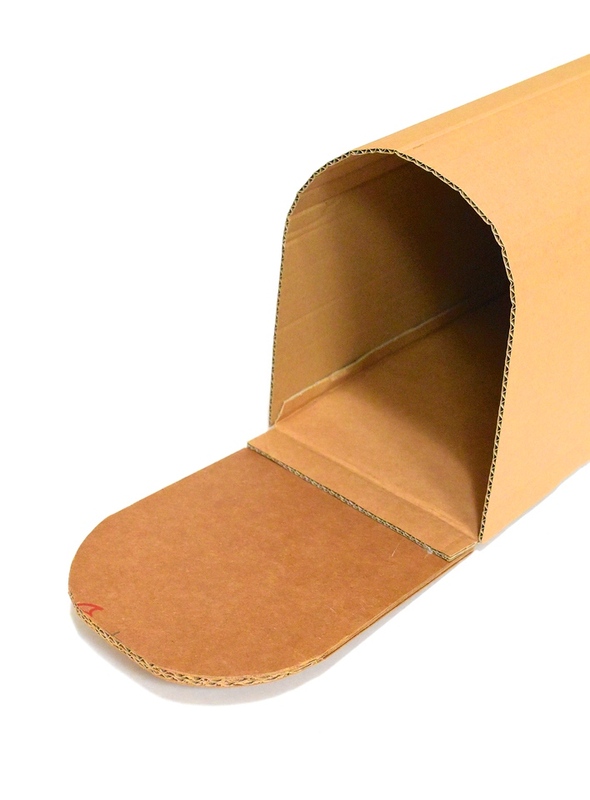 and slide the cardboard aid out. 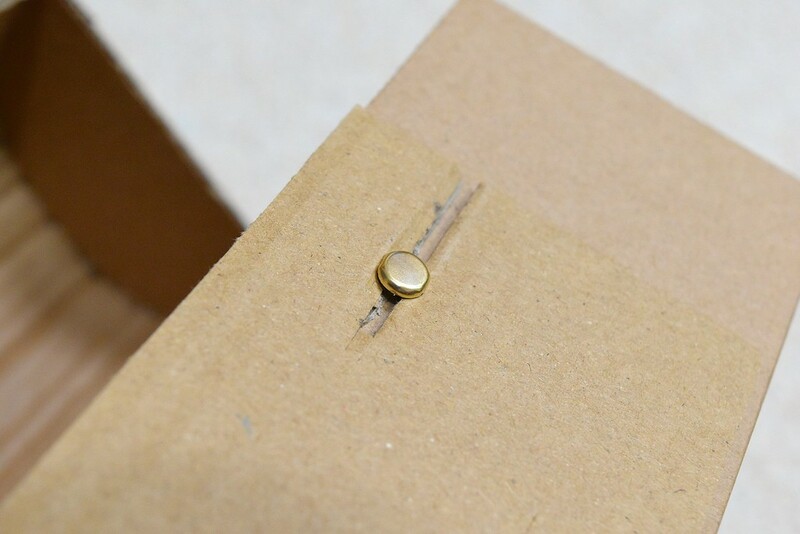 There is now a perfect gap between the stud and the cardboard surface, allowing easy looping of the rubber band around it. 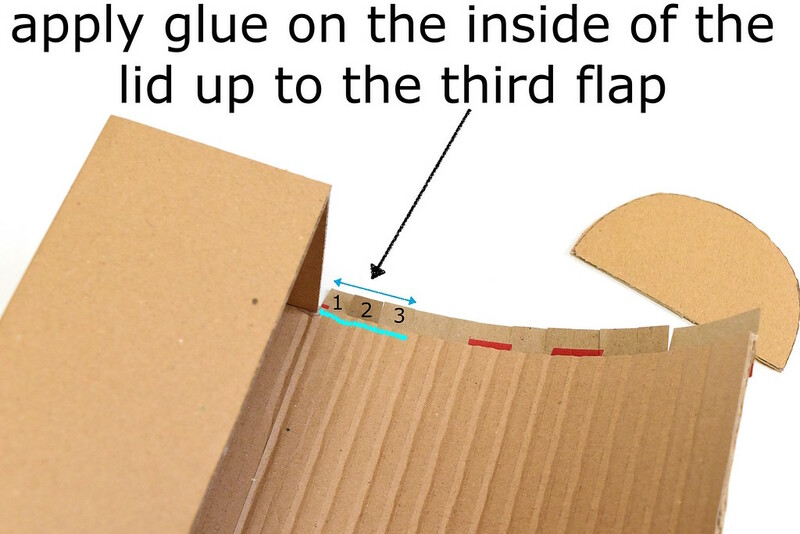 That gap also allows the edges of the popsicle sticks to tuck under it. 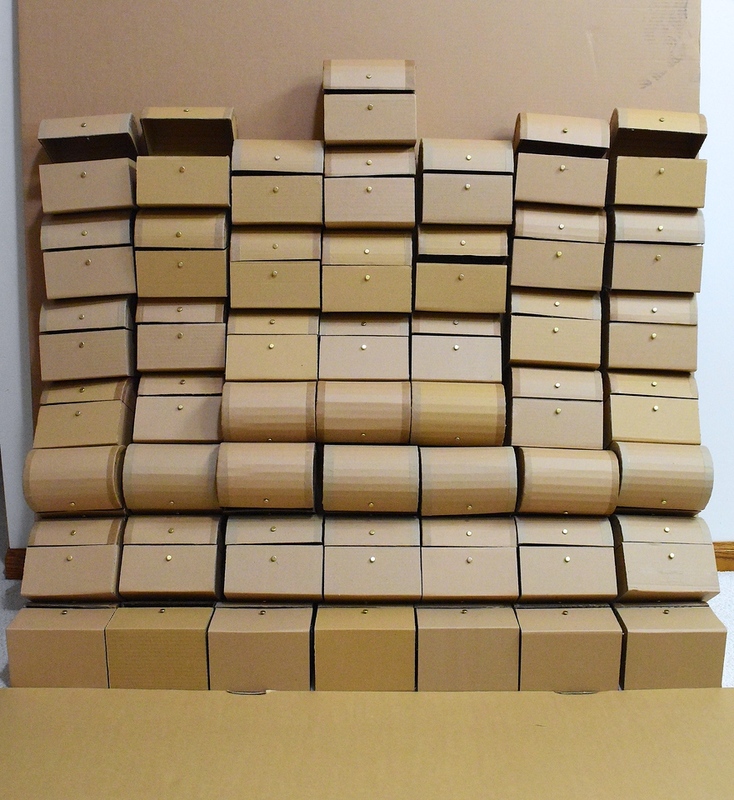 It made installing 100 paper fasteners go a lot more quickly! Here are the finished chests. There are fewer things more glorious than a mass-produced wall of cardboard things against a backdrop of even more cardboard. 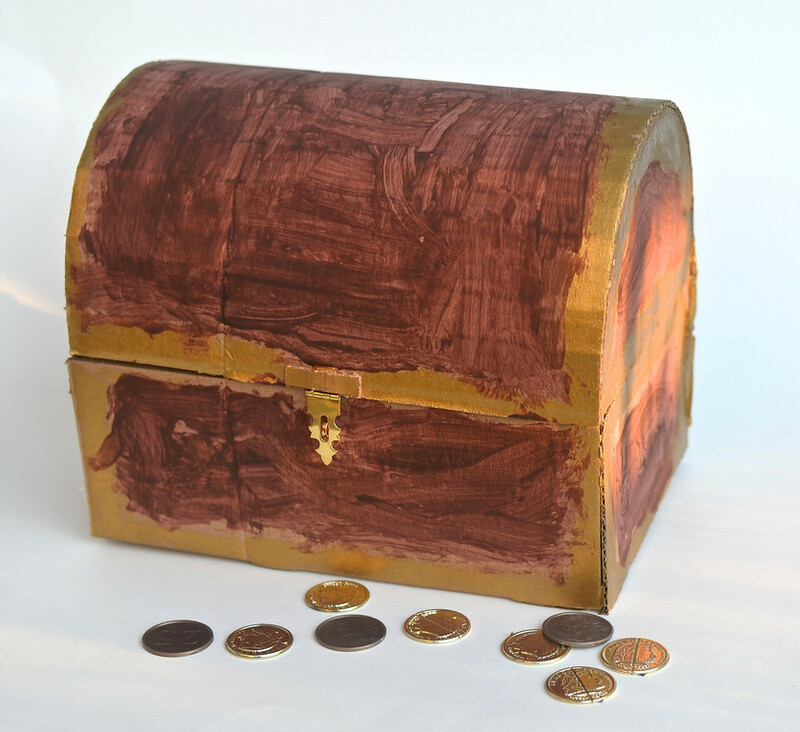 There are many ways to dress up a plain treasure chest but here is the version our kids will be making during our summer program. 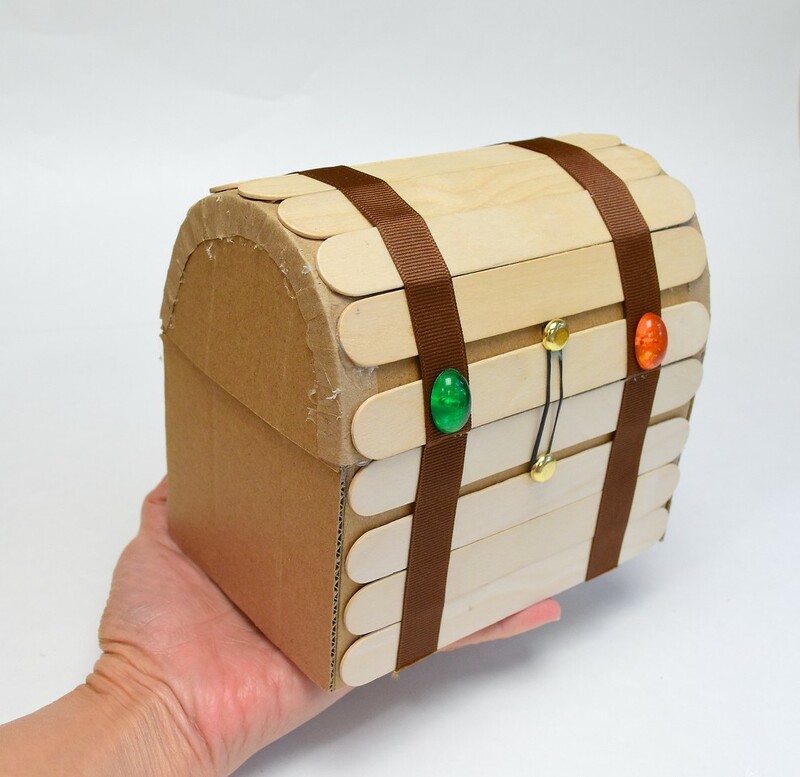 The older kids will be given a bare treasure chest and a lot of freedom to paint it, glue popsicle sticks onto it, glue popsicle sticks onto it and then paint it, add ribbons to mimic leather straps, stick on gems for a bit of bling, and anything else they're inspired to do. 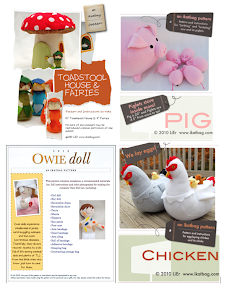 They will work with tacky glue, scissors, ribbons, gems, paint, Sharpies, and cord. The preschoolers will be given the chests with the popsicle sticks already glued on, and they can paint or not-paint, or color everything with markers, or add stickers, or their names in foam letters. They will work with washable markers, stickers, and paint. 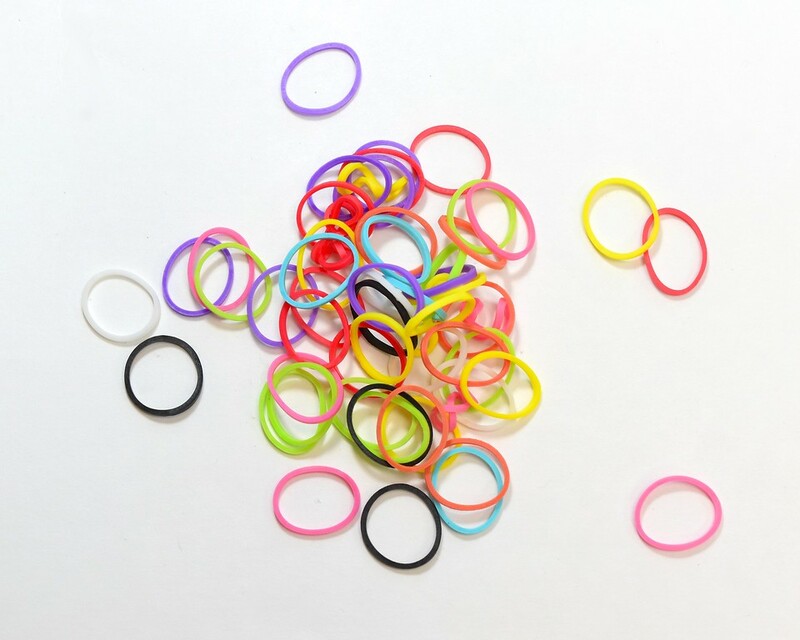 Finally, everyone gets to pick their rubber bands and secure the lid shut. I hope you make these some day! One last thing before I sign off. 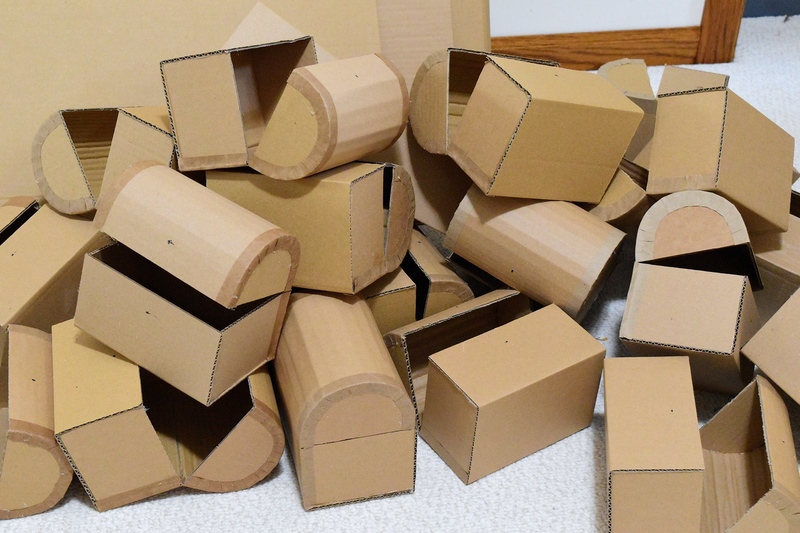 At the beginning of this post, I showed remarkable (and excruciating) restraint in praising the extraordinary marvelousness of cardboard. Hardest thing ever. Interestingly, there appeared yesterday in the New York Times, an article doing just that (the exulting, I mean; not the restraining)! 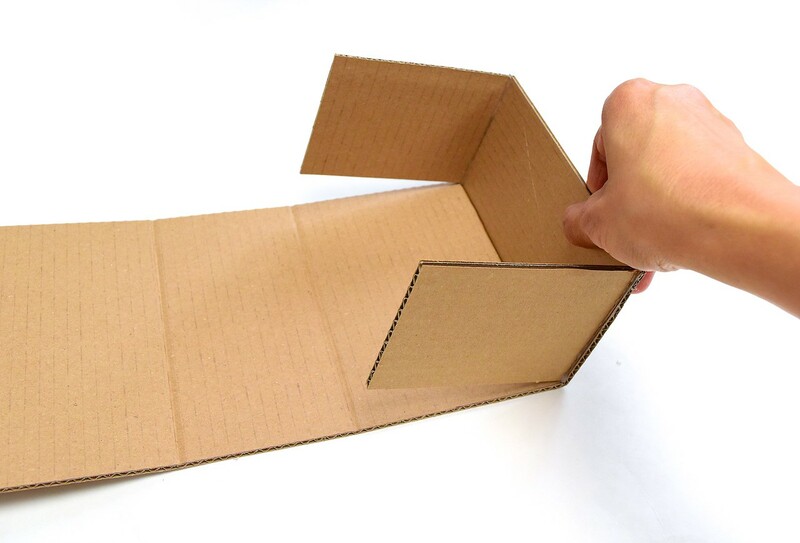 It's called "The Magic of a Cardboard Box". 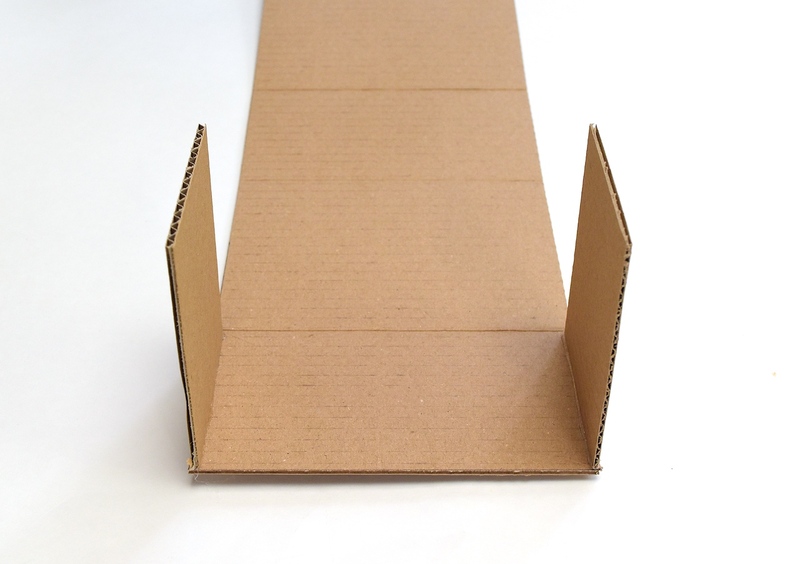 Never mind that they're almost an entire decade behind - it's always a cause for rejoicing when anyone recognizes cardboard's incomparable superlativeness and spreads the word. In The NYT, no less. The New York Times, people! Need I say more? No, I do not. I saw these today and immediately thought of you: http://www.leevalley.com/us/Garden/page.aspx?cat=2,40725&p=75024. 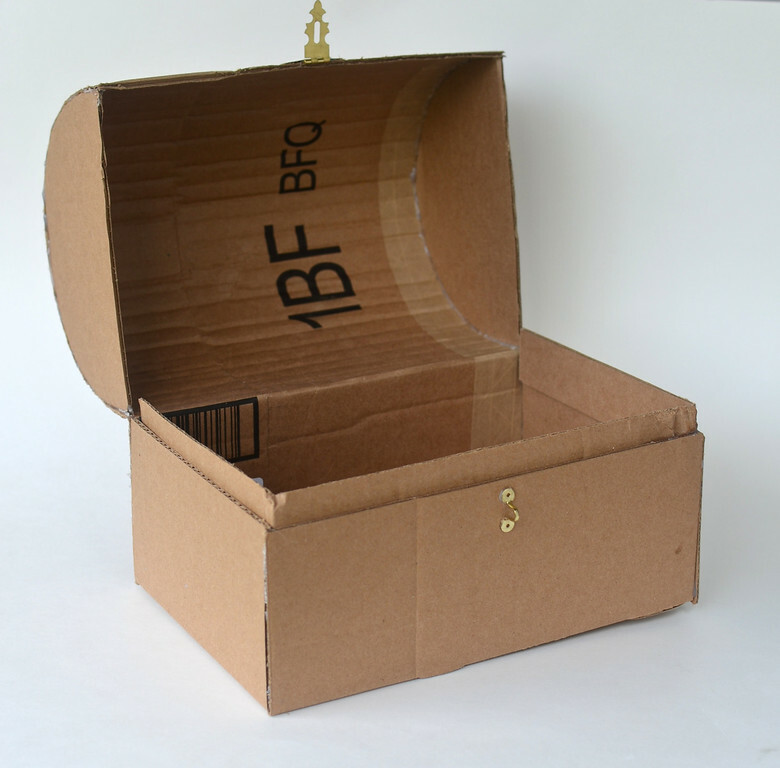 So I was thrilled to check your blog today and see you were working with cardboard! Thank you for sharing your know how. These treasure chests are adorable. I want one for me! Cardboard and paper mache are my mom's favorite mediums. We had the most amazing fridge box lemonade stands, playhouses, an indoor skating rink, and paper-tube castles. 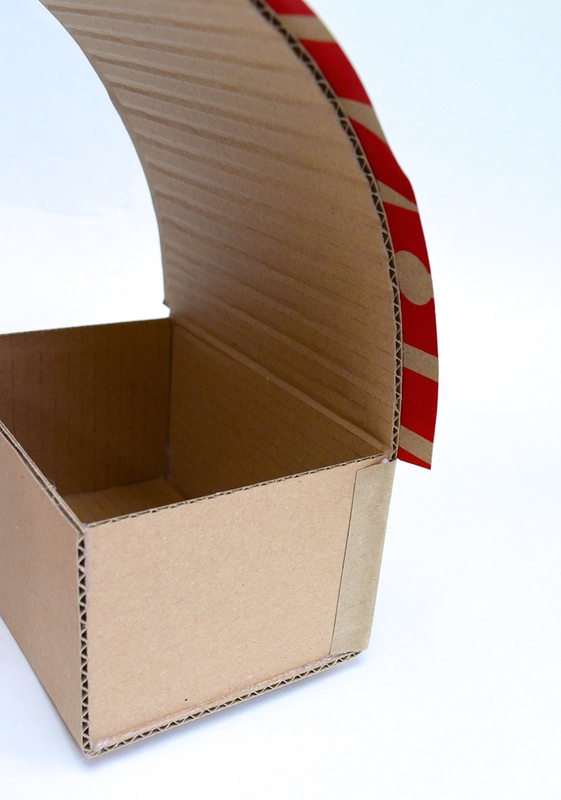 Who can resist the possibilities of an empty box? I love your ideas!